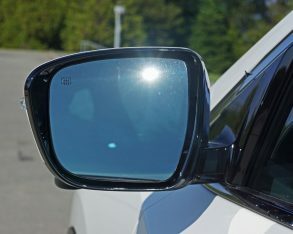 pass by, my neck takes a spin and eyes lock on until it disappears in the distance. 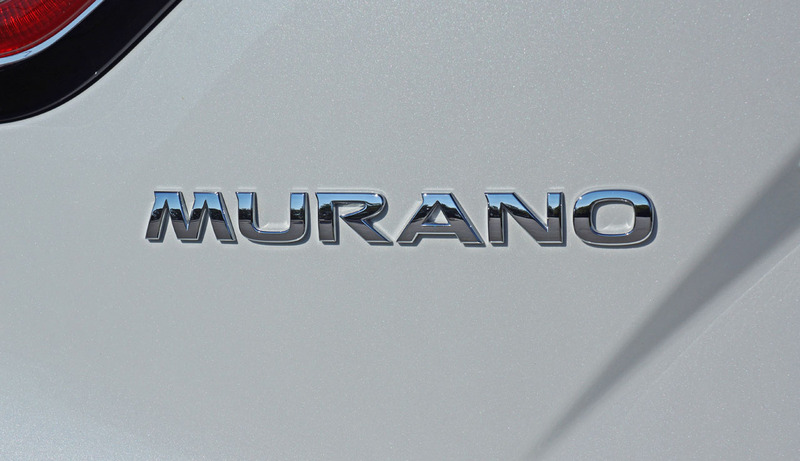 The Japanese brand is certainly onto something. 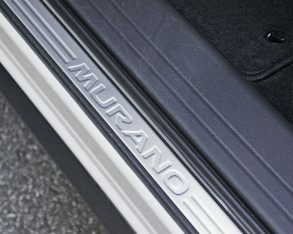 a similar effect on its pick guard, fret and head detailing, it’s not the kind of memory I want to dredge up in my next ride. 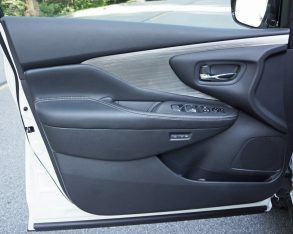 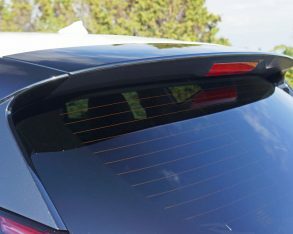 trim was also wider on the passenger side. 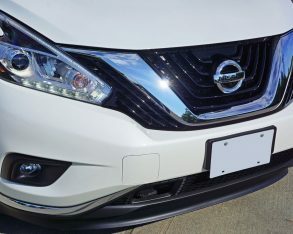 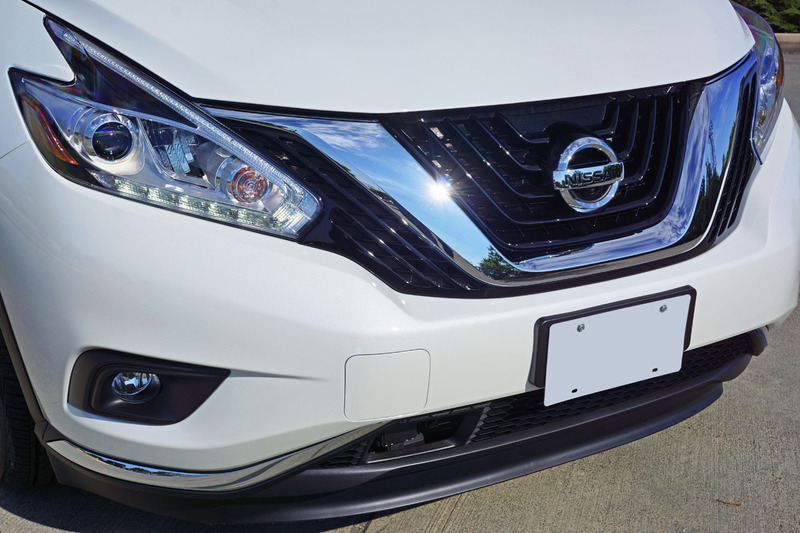 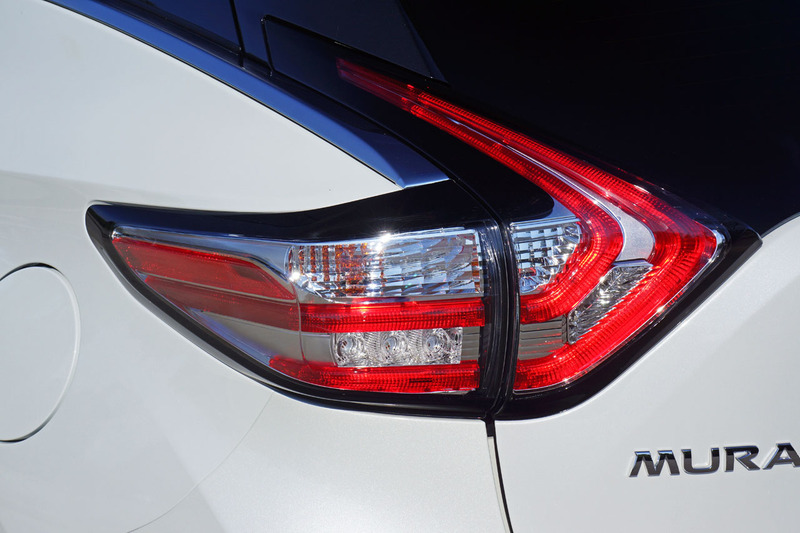 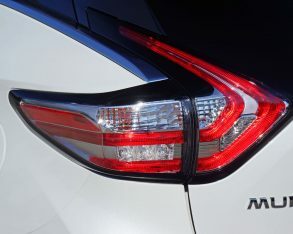 Nissan, if you’re going to go with a lighter trim on a black background it has to line up in order to look good. 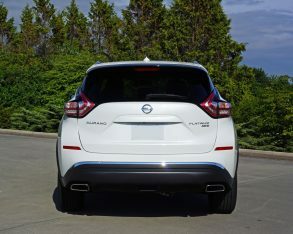 Was this particular SUV in an MVA and then rebuilt? 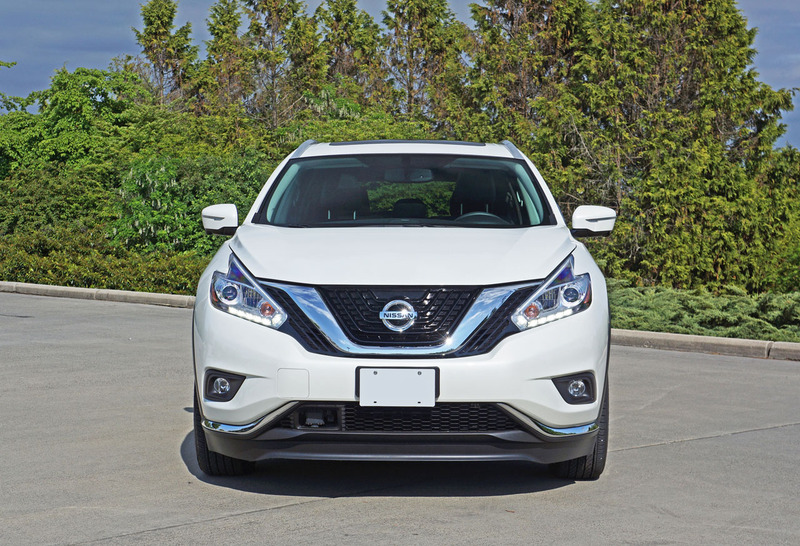 I hope so for Nissan’s sake, because if this is the fit and finish coming out of Canton, Mississippi I’ll need to ask them to please take assembly back to the old Murano’s Nissan Shatai facility in Kanda, Fukuoka, Japan and start over. 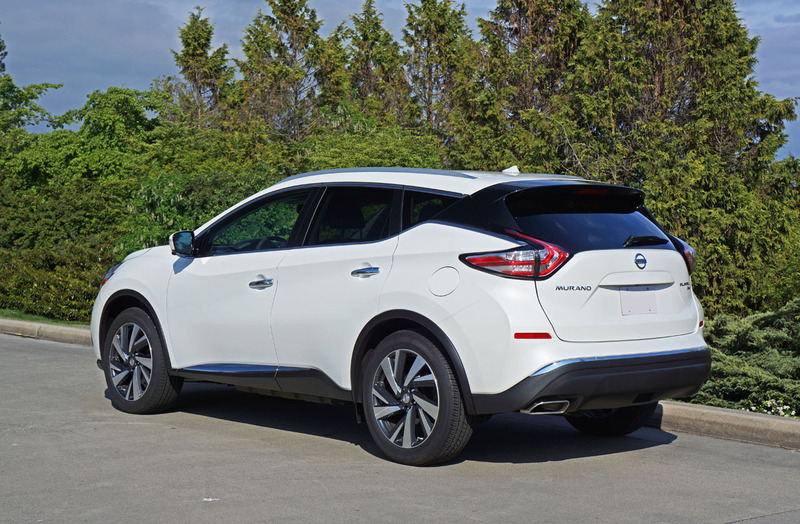 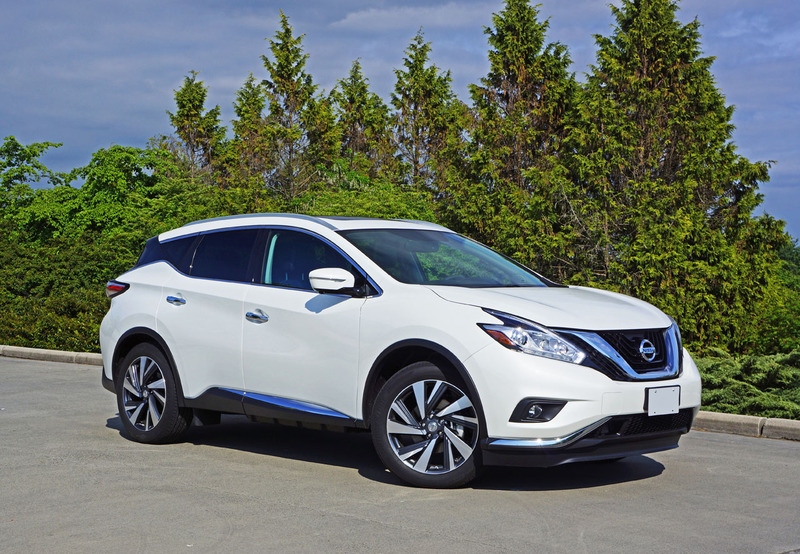 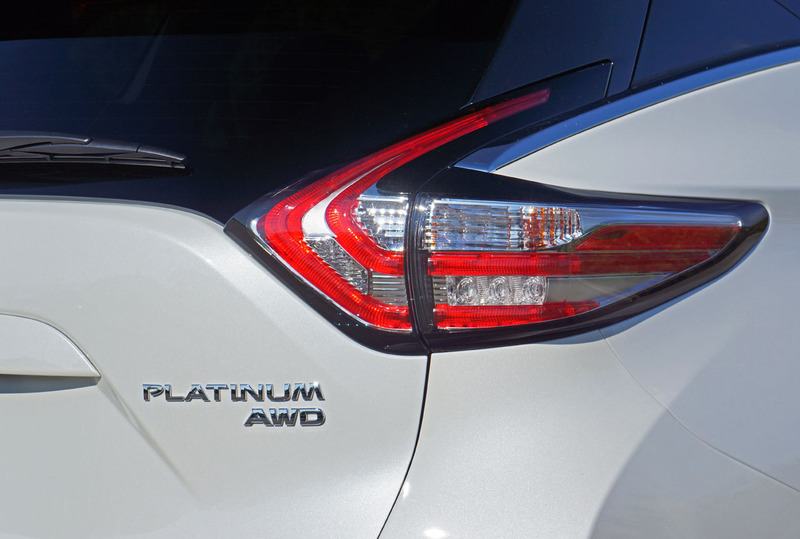 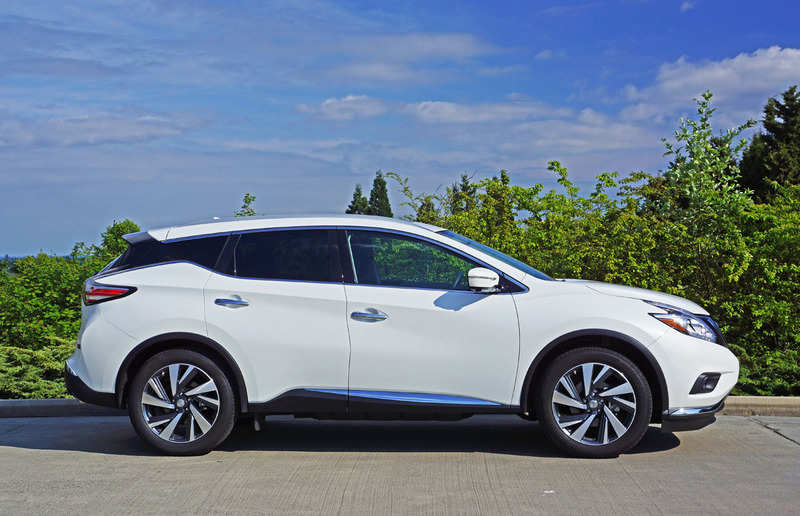 Let’s just consider this a one-off problem and move on, although if you’re seriously considering a new Murano, make sure to check over the details of the one you’re buying to make sure it measures up to your personal quality requirements. 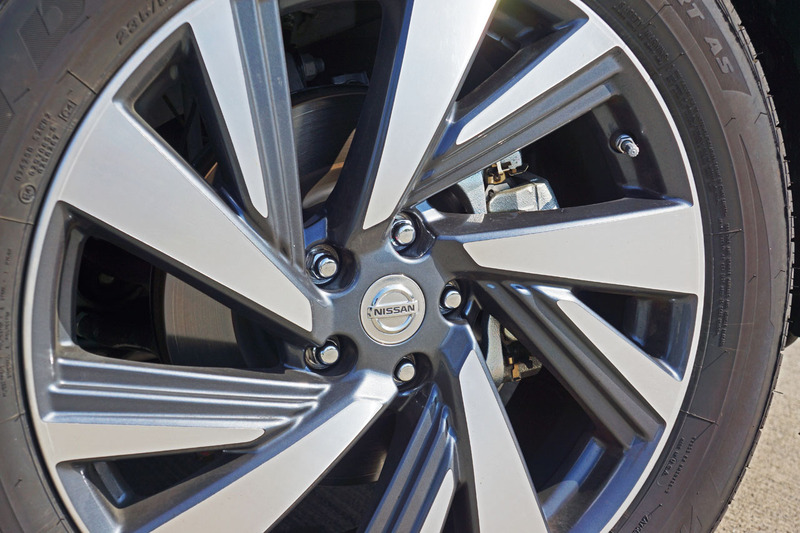 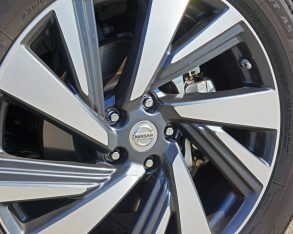 Nissan has managed to create a wonderfully organic and significantly refined look that I happen to like a lot. 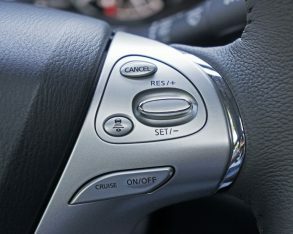 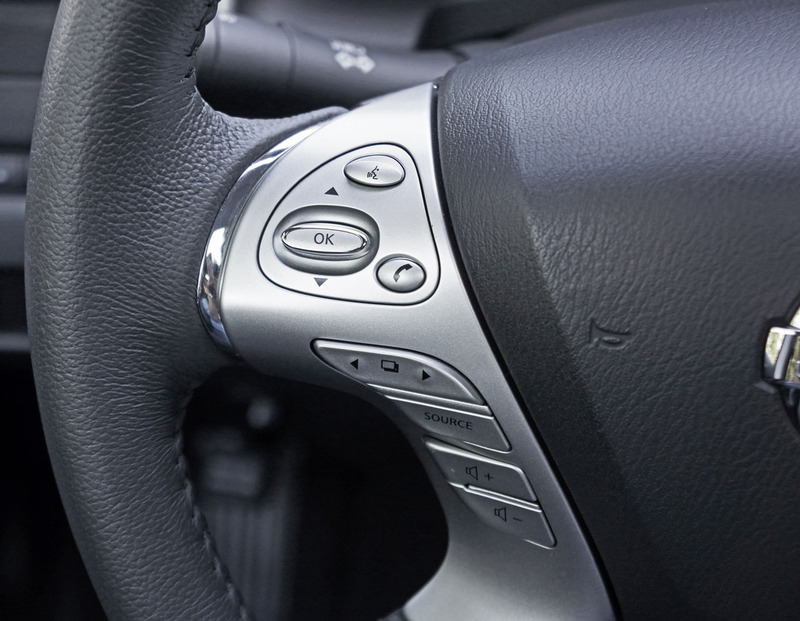 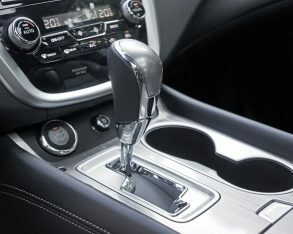 Some especially nice detailing includes satin-silver trim on the steering wheel spokes, around the vents, the centre stack, shifter, and trimming each analog gauge, while chrome adds a bit of bling to those steering wheel spokes, around each circular knob and dial on the centre stack, etcetera. 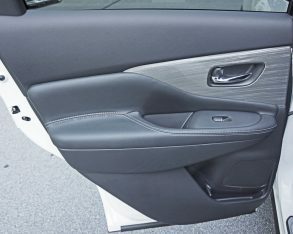 Additional upscale accoutrements include padded fabric wrapped A-pillars, something very rare to see in the mainstream volume sector. 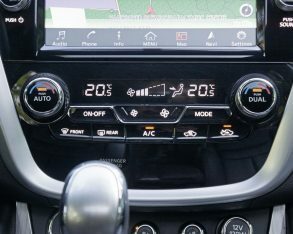 and I suppose the tachometer and speedometer, finished in traditional white on black, aren’t out of the ordinary, but between the two sits a considerably sized full-colour high-resolution TFT multi-information display filled to the brim with ultra-useful driver-specific info. 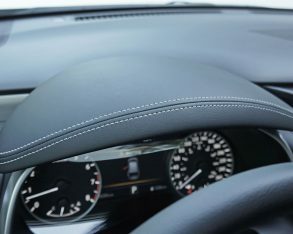 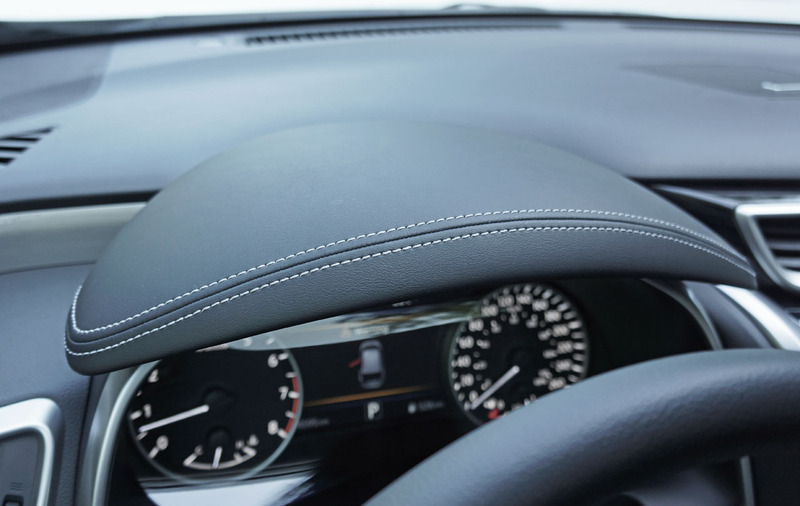 A thick and substantive leather-clad steering wheel frames the entire package while incorporating all necessary controls for the MID and more on those satin-silver surfaced spokes I mentioned a moment ago, while the switchgear quality is superb. 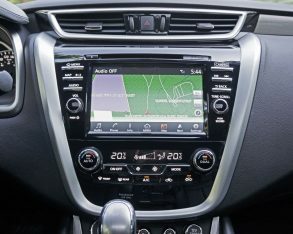 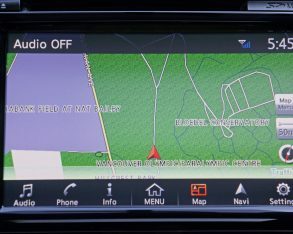 The same goes for the impressively damped and tightly fitted buttons and knobs on the centre stack including those surrounding the large high-res infotainment touchscreen and HVAC interface just below, while Nissan dresses up the panel in a sharp looking piano black lacquered plastic. 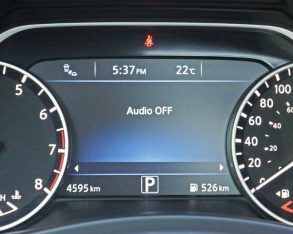 clear display. 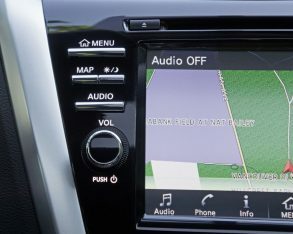 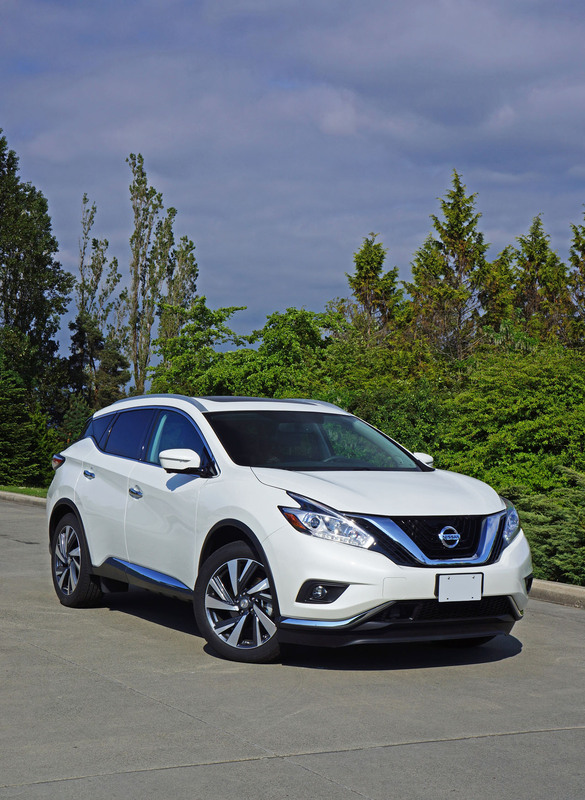 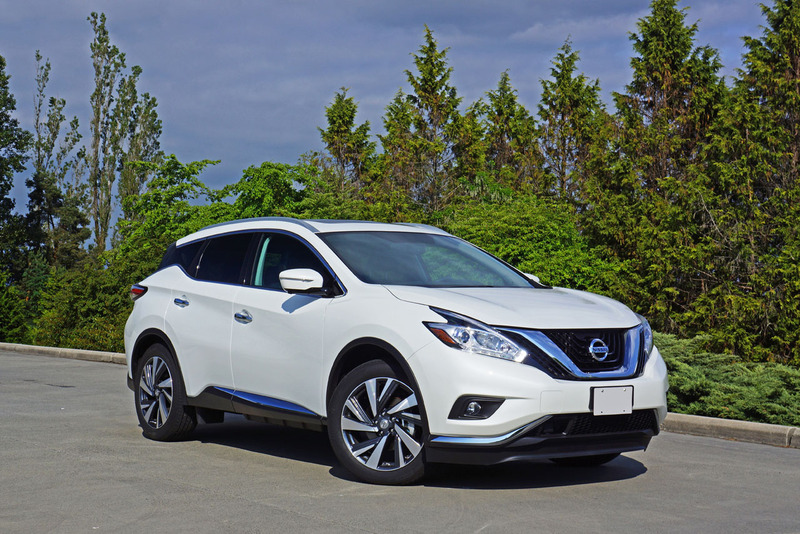 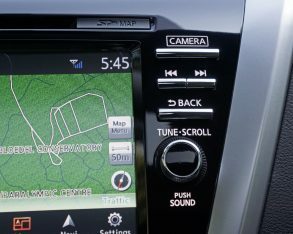 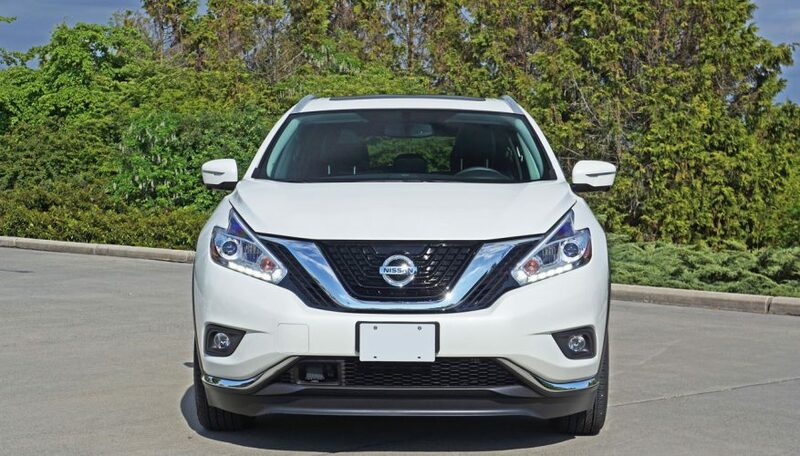 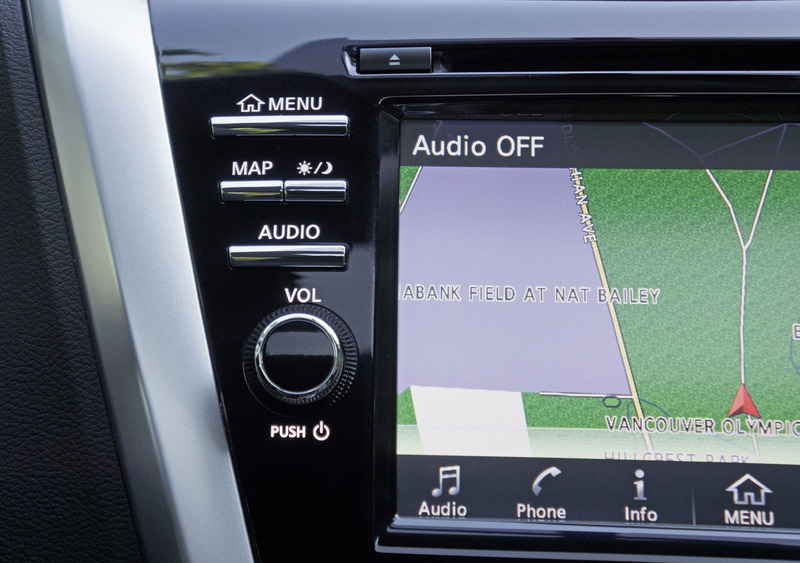 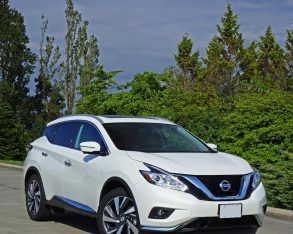 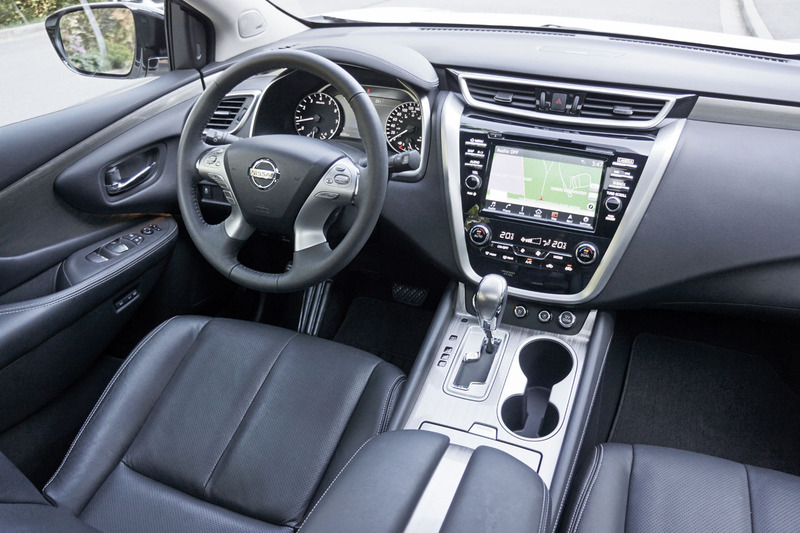 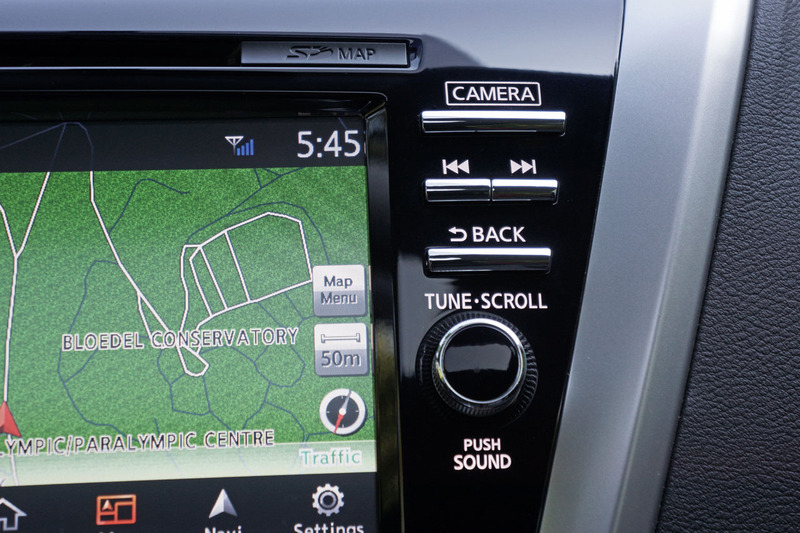 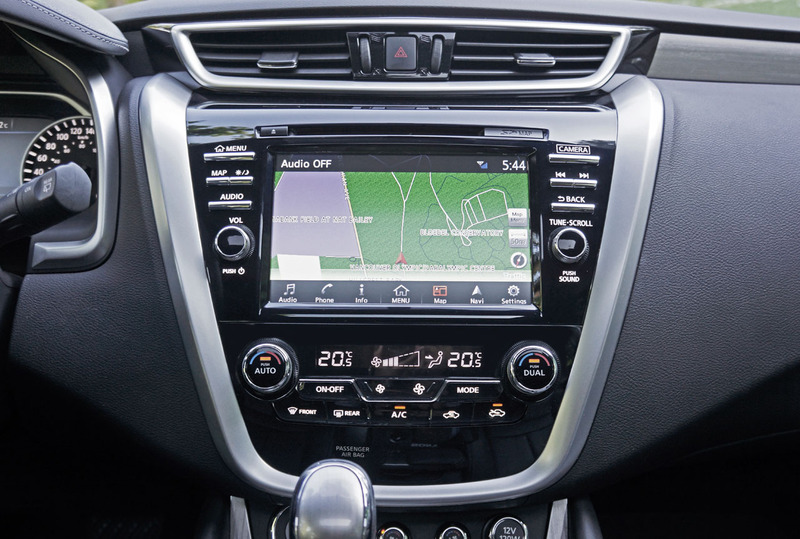 Its features include a backup camera, navigation, phone controls, access to a great sounding Bose audio system, as well as vehicle settings, additional info on just about anything to do with the Murano, and a useful menu button at centre for guiding you through the entire system. 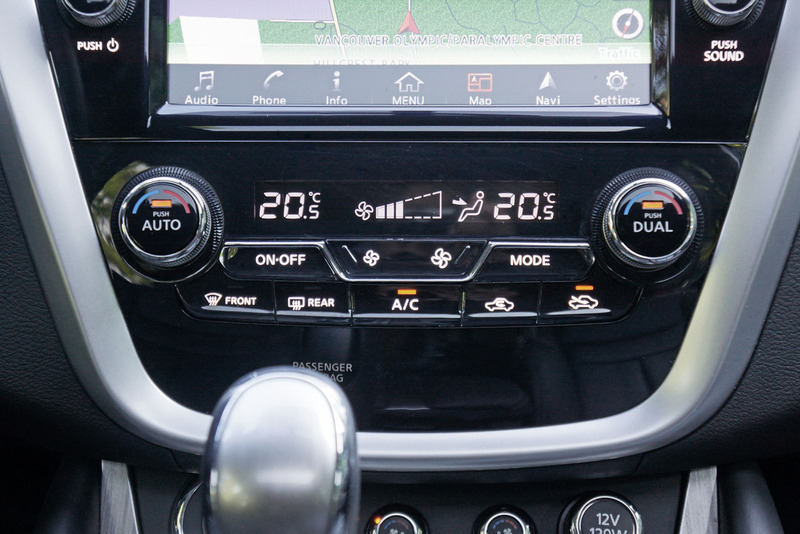 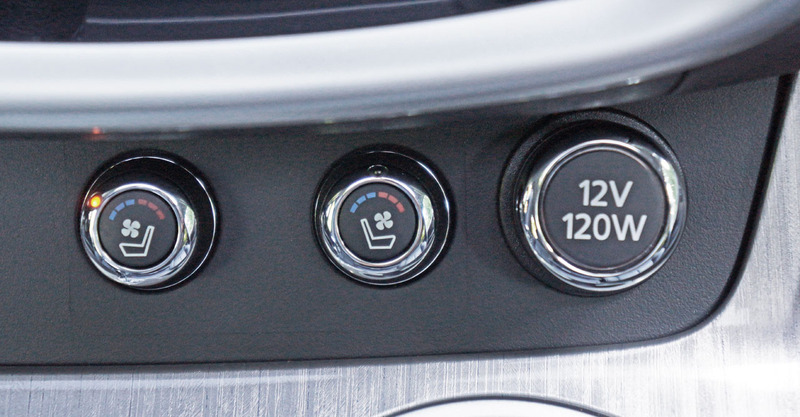 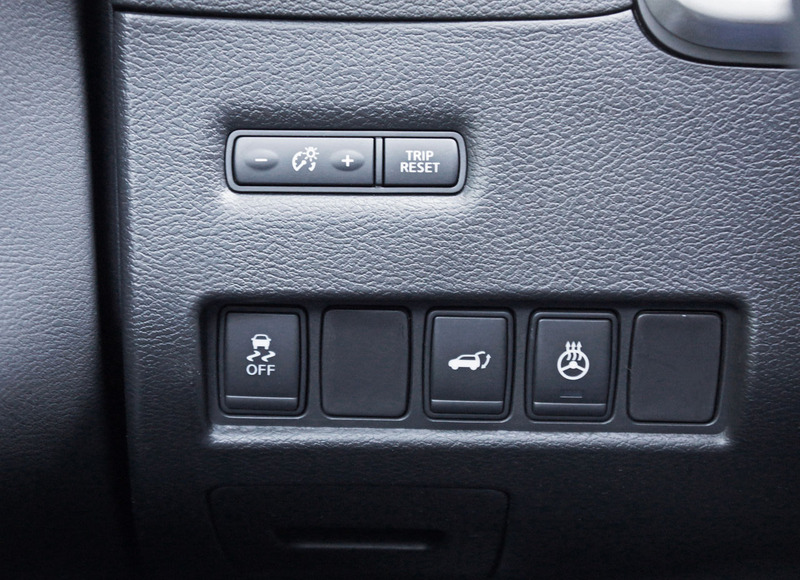 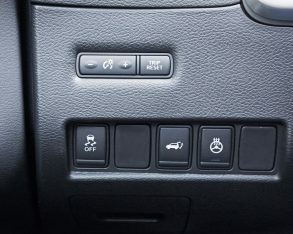 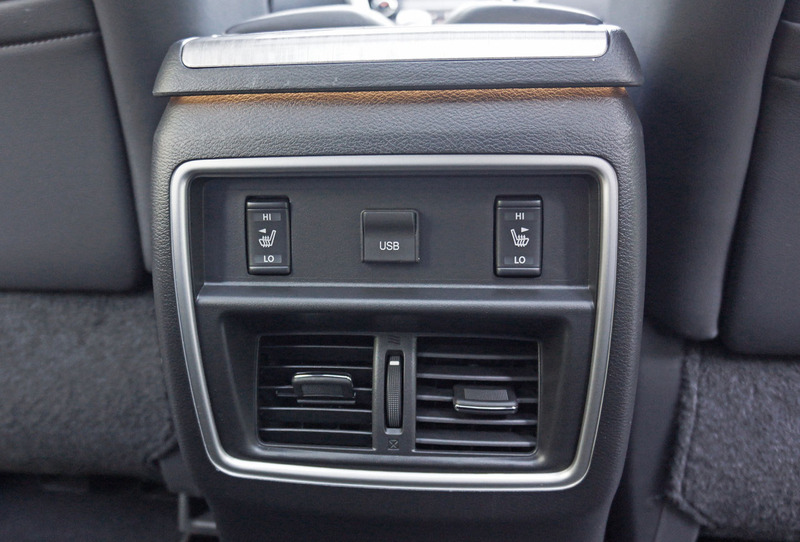 Just below, the dual-zone auto HVAC system is dead simple to use thanks to a two-temperature-dial layout, small digital display and twin rows of smartly assorted buttons. 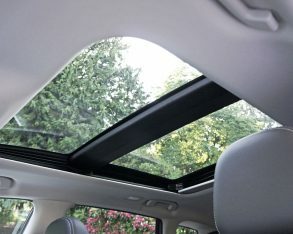 ventilation that was extremely refreshing during the heat of summer. 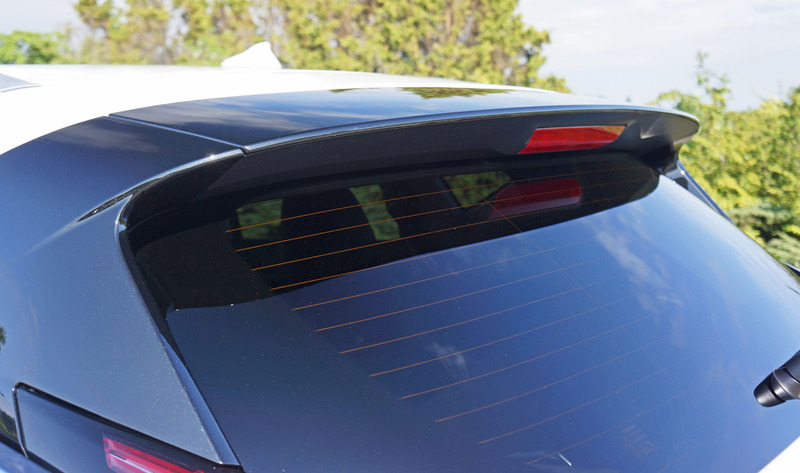 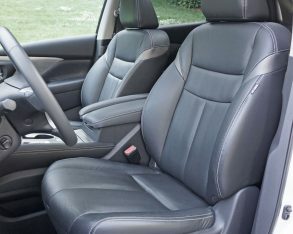 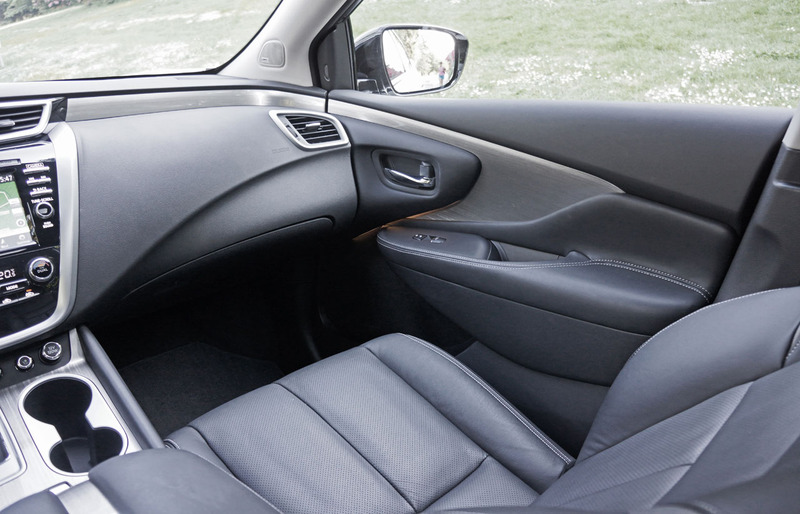 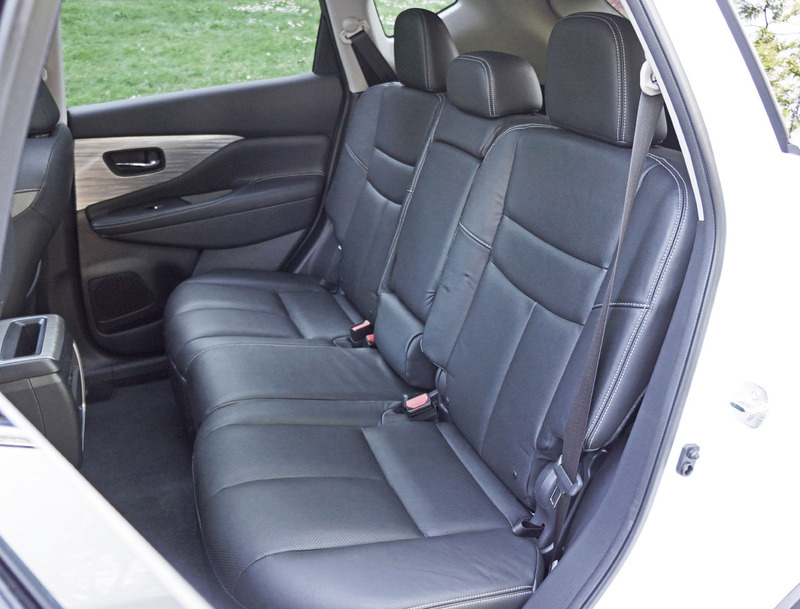 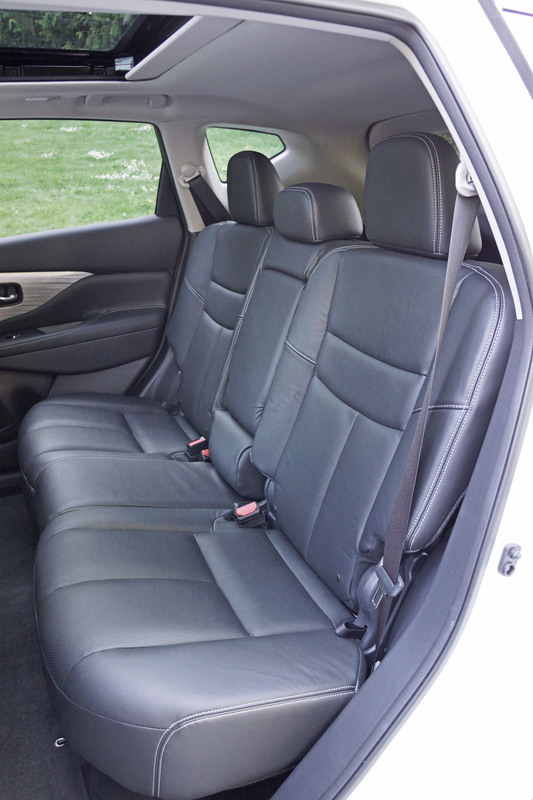 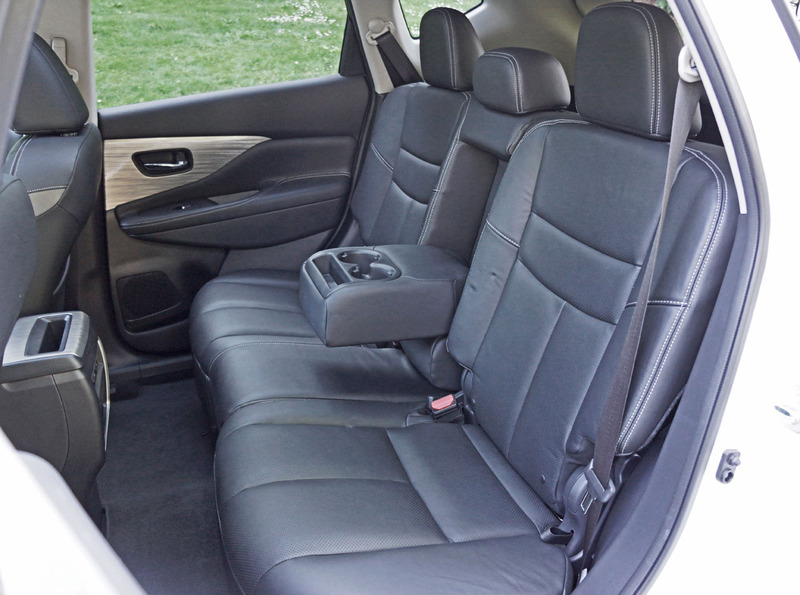 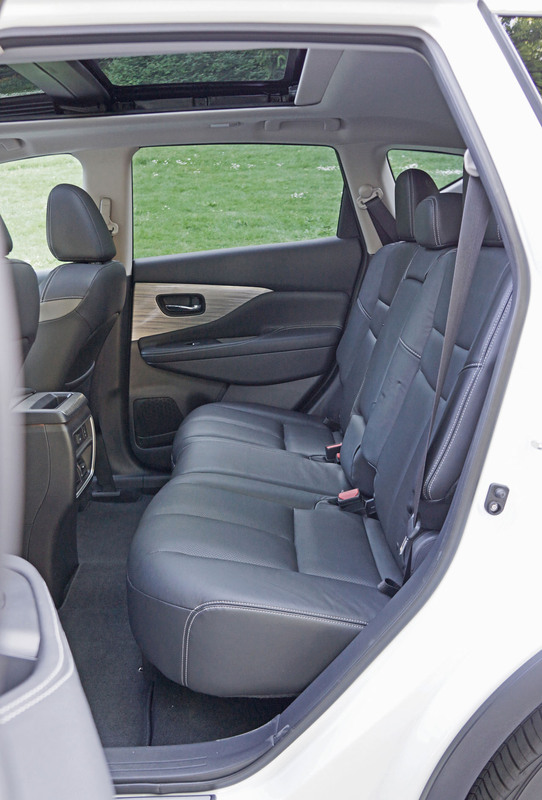 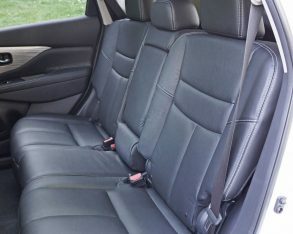 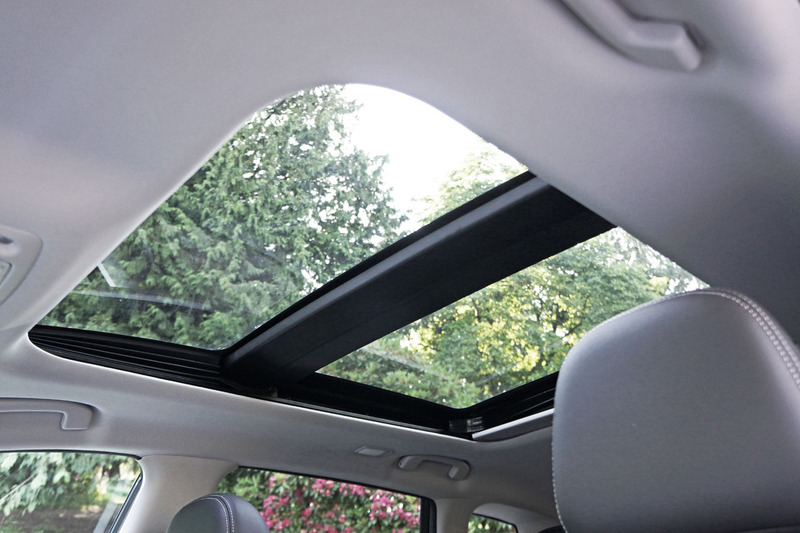 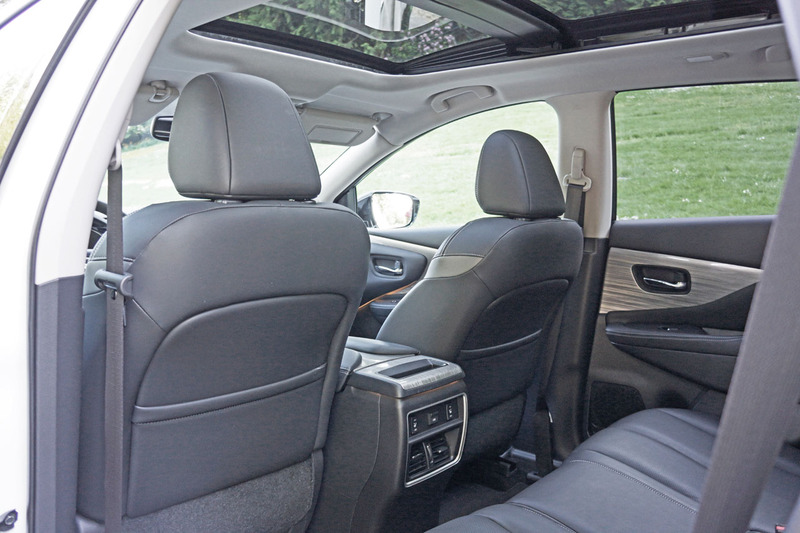 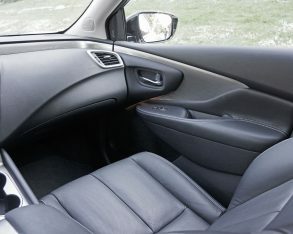 The rear seating area was even roomier with impressive legroom and more than enough headroom for taller teens, not to mention ample shoulder and hip room, while it felt even more open and airy due to an expansive panoramic glass sunroof with powered sunshade overhead. 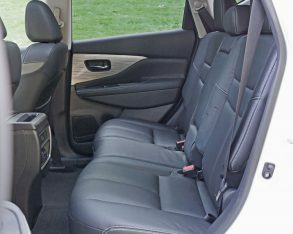 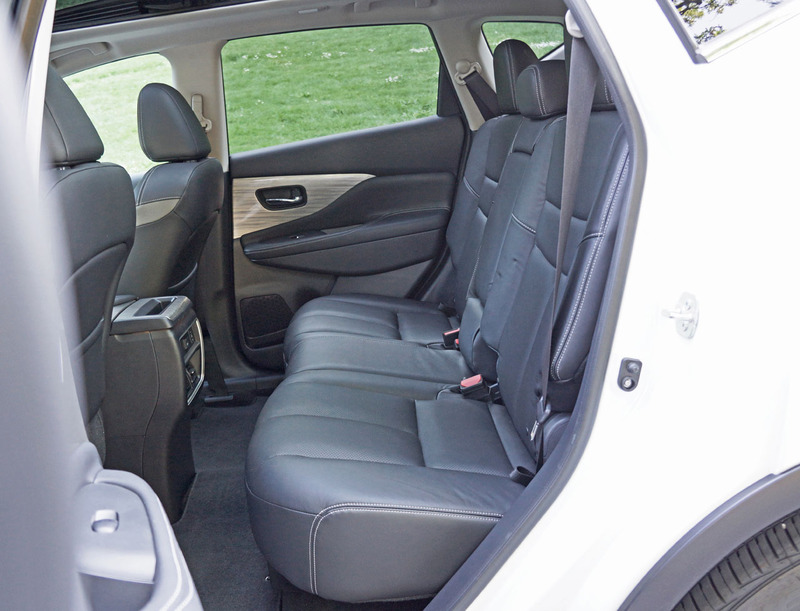 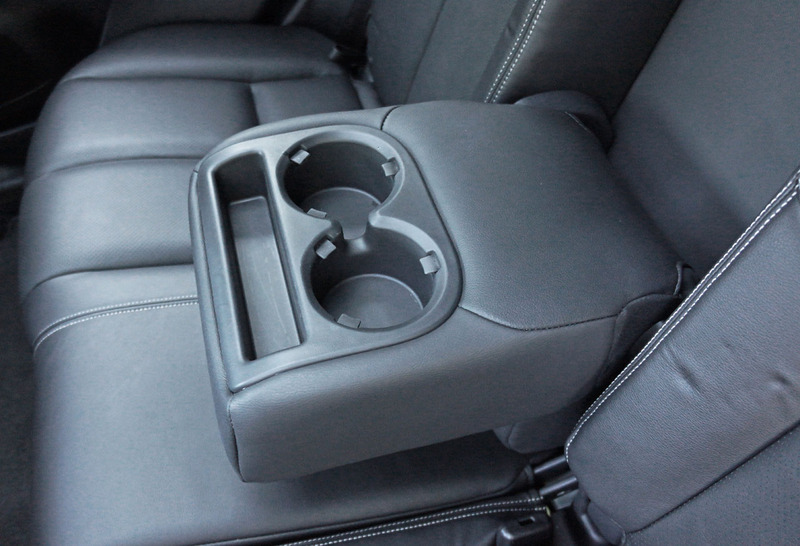 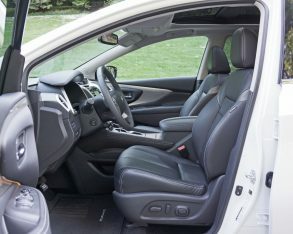 A few of the Platinum model’s rear seating area features that don’t come in SL trim include heatable rear outboard seats and power return rear seatbacks. 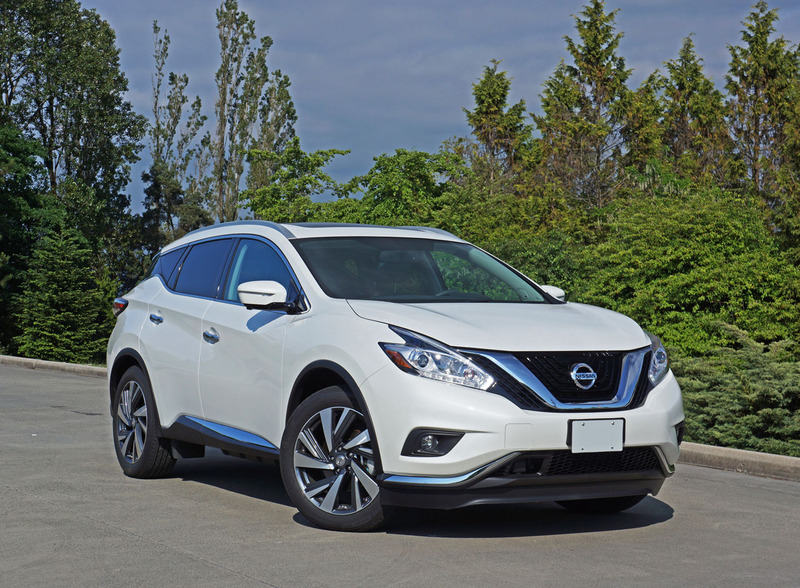 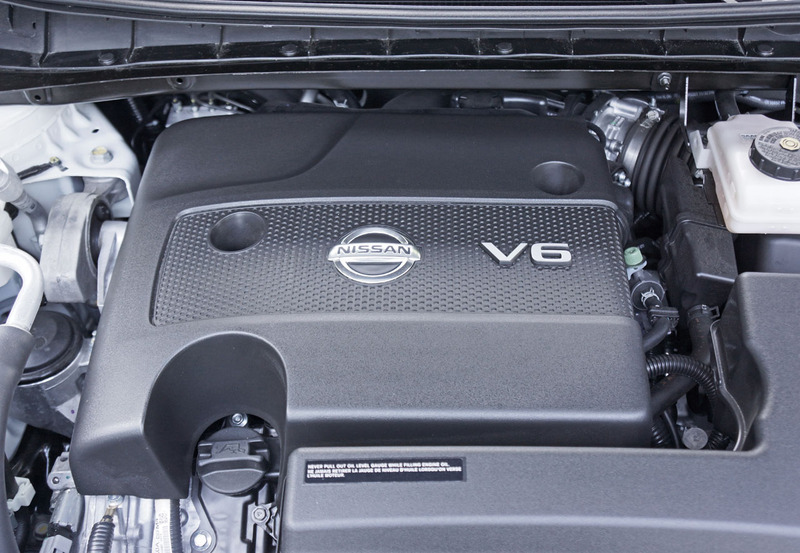 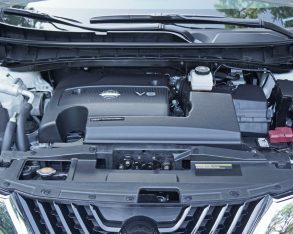 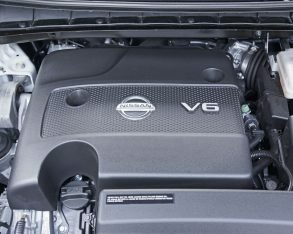 This is easily the stuff of a $43,498 SUV with or without a premium badge, but before you start getting excited there’s a lot more that comes with this top-tier Nissan. 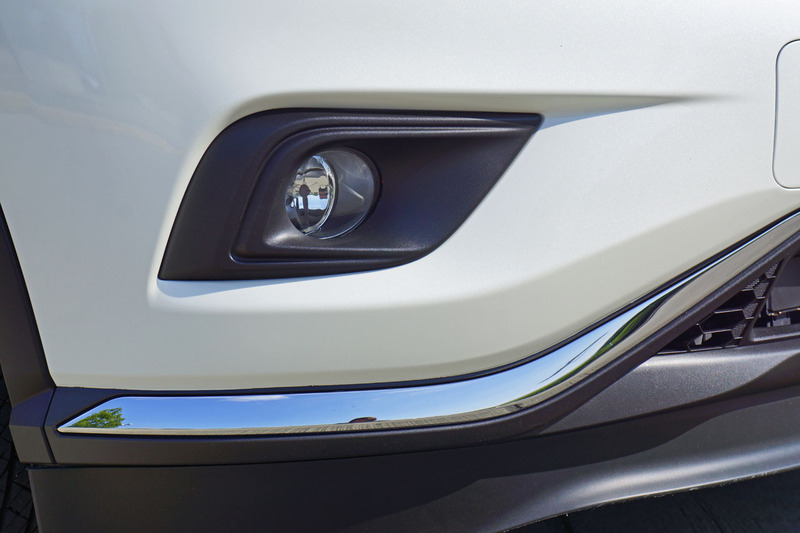 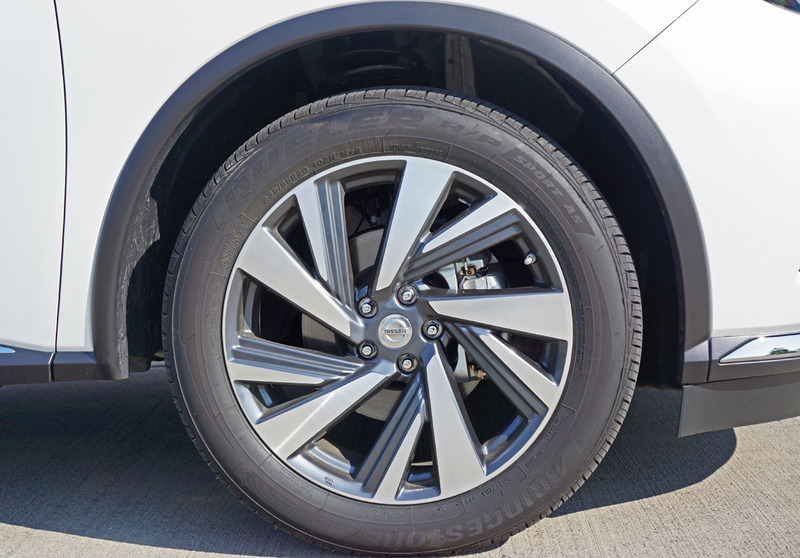 enhance the CUV’s already impressive handling. 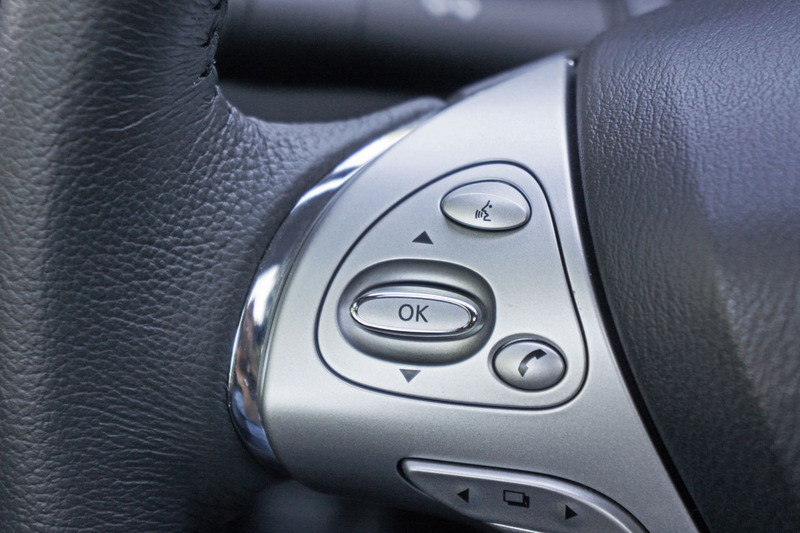 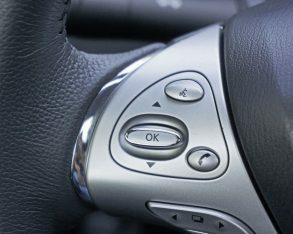 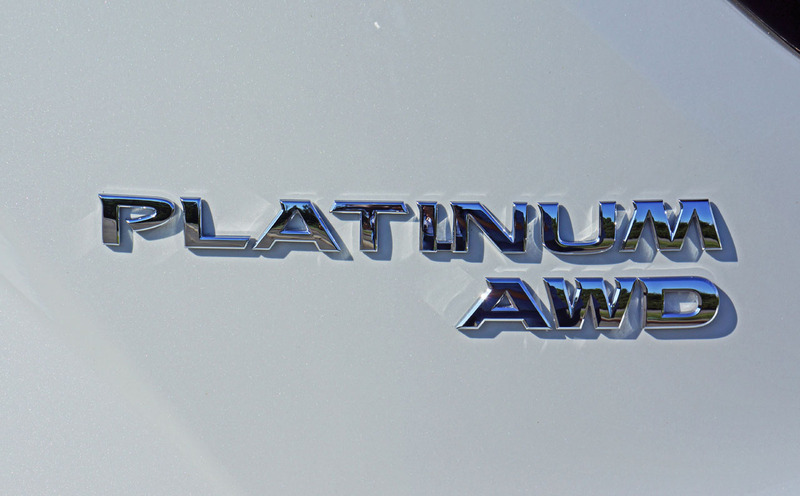 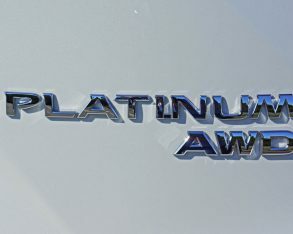 I don’t know about you, but anytime I’ve experienced adaptive cruise control while on a road trip I arrive a lot more refreshed, while the memory driver’s seat and mirrors from lower trims also adjust the powered tilt and telescopic steering column in the Platinum. 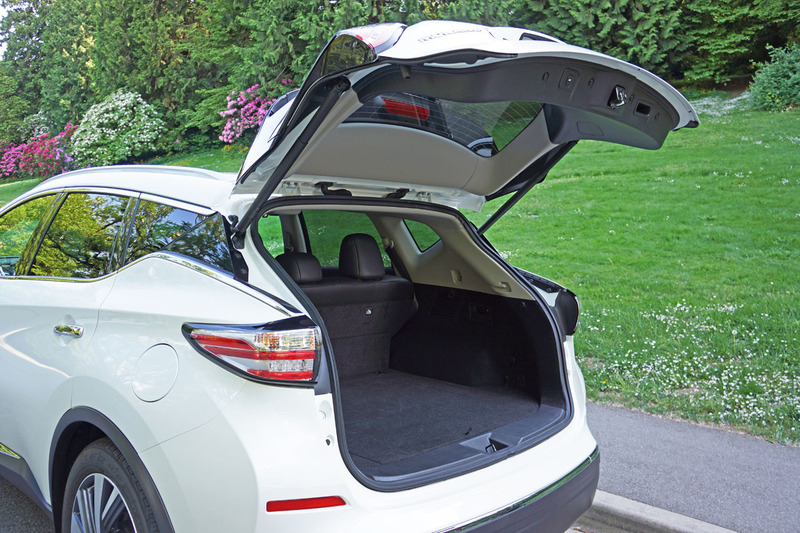 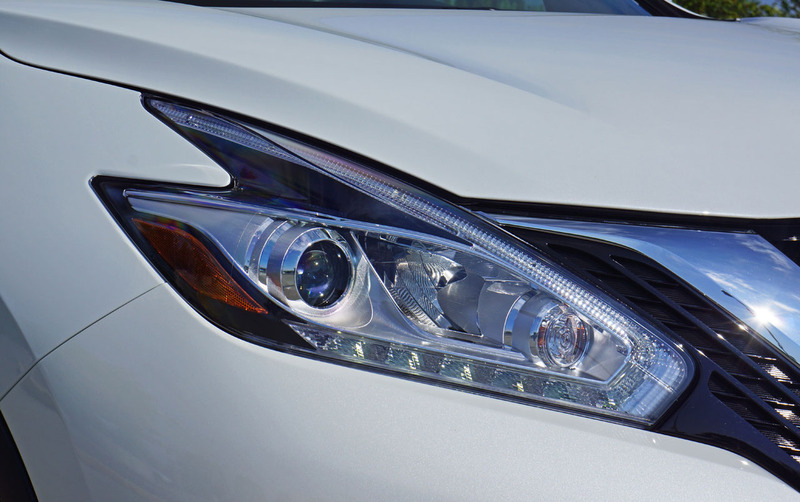 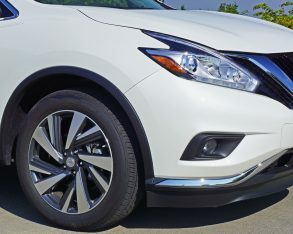 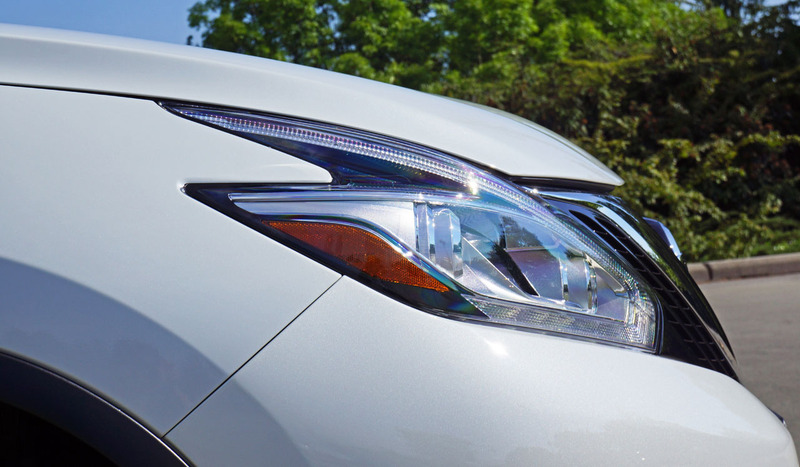 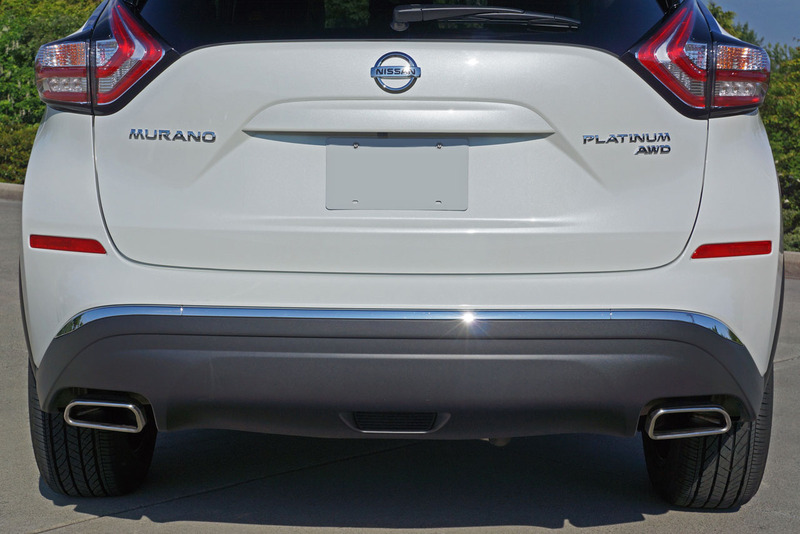 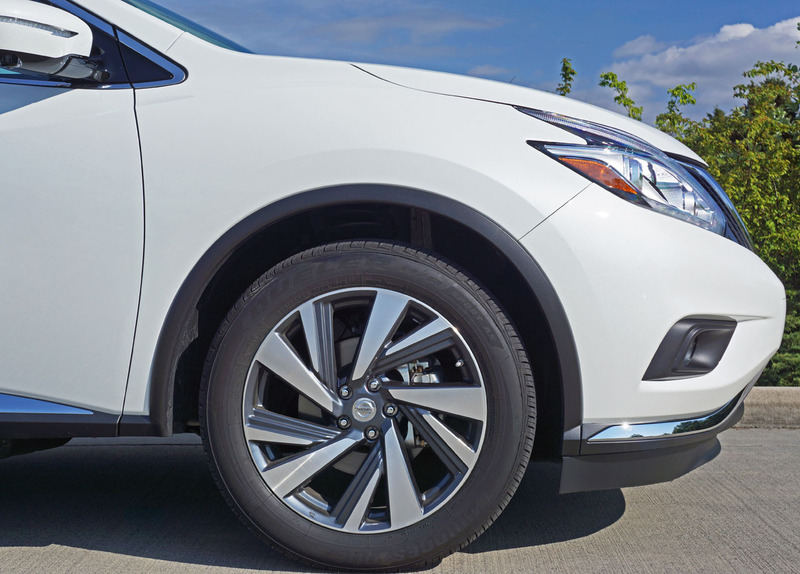 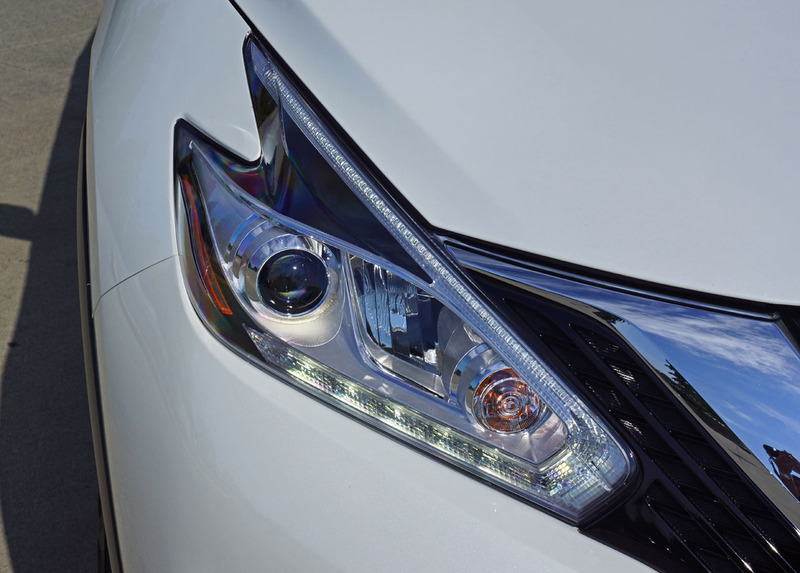 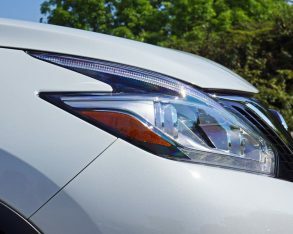 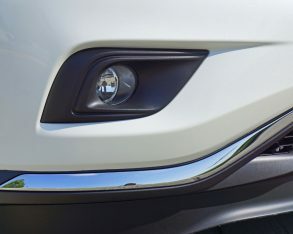 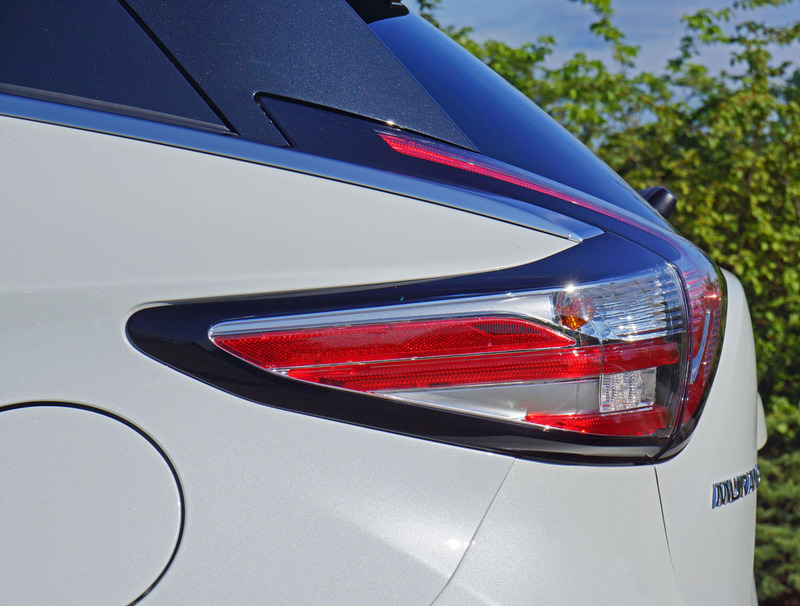 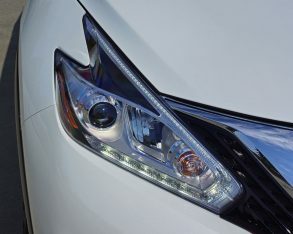 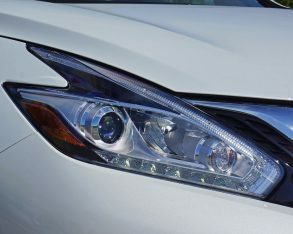 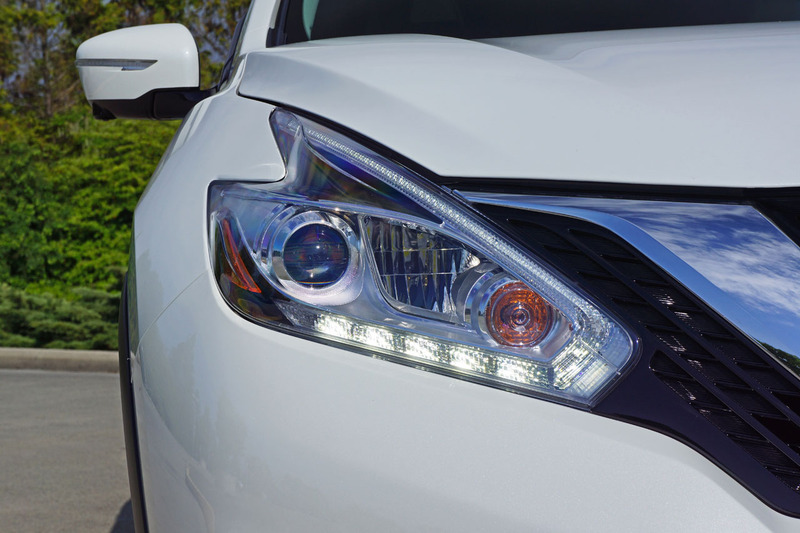 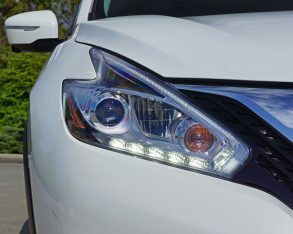 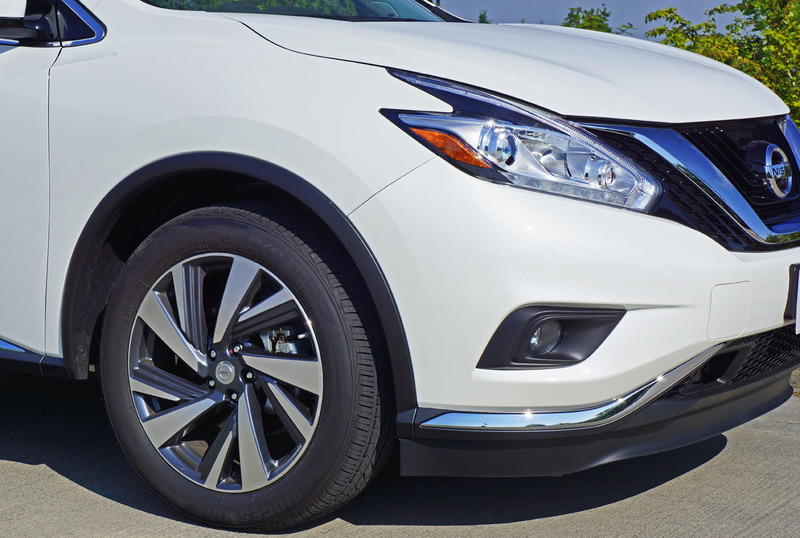 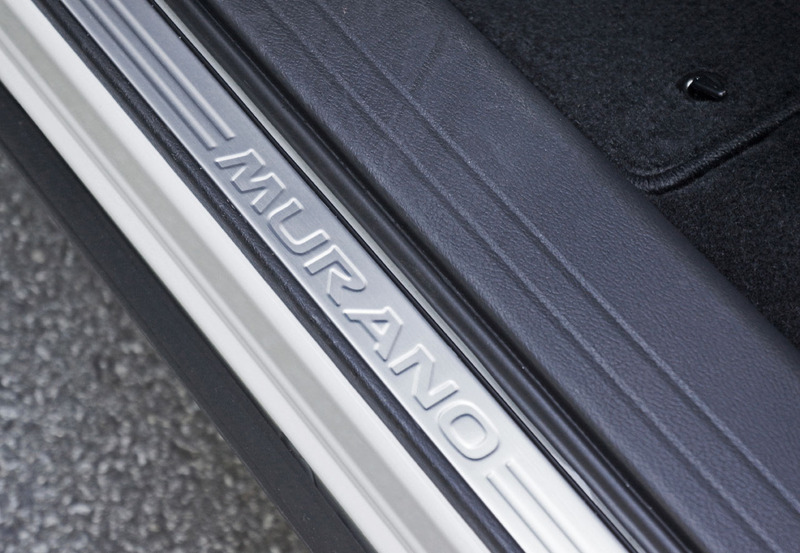 Lastly, the Murano’s suite of active safety features gets bumped up to include predictive forward collision warning and forward emergency braking in this top-line trim, just like an Infiniti. 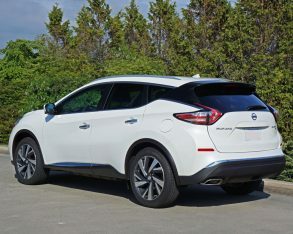 low $29,998, plus $1,750 for freight and pre-delivery prep, while including front-wheel drive instead of standard all-wheel drive as is the case in SL trim and above, but still featuring a standard V6, proximity-sensing passive access with pushbutton start/stop, the same 178 mm (7.0-inch) MID between the primary gauges I noted earlier (that Nissan calls Advanced Drive-Assist Display), the navigation and rearview camera enhanced 203 mm (8.0-inch) multi-touch control infotainment system, dual-zone auto climate control with microfiltration, and this model’s Brushed Silver (or Jasper Pearlescent) trim I previously went on and on about ad nauseam. 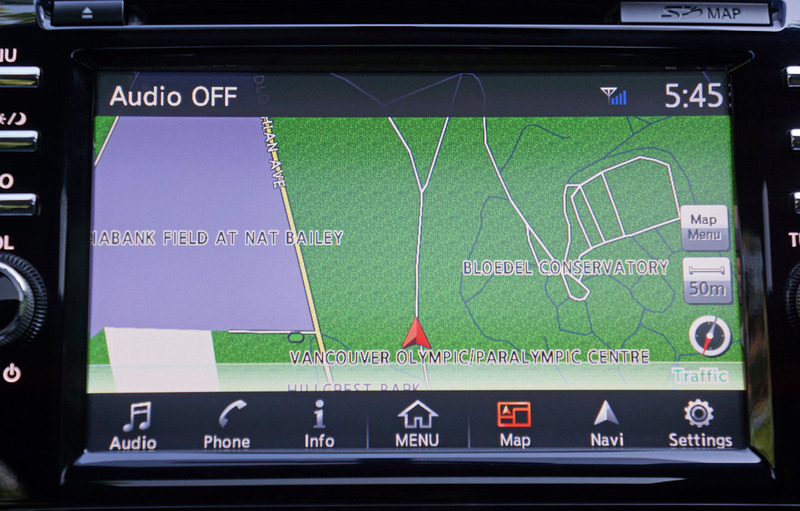 Sounds pretty good for a standard menu, huh? 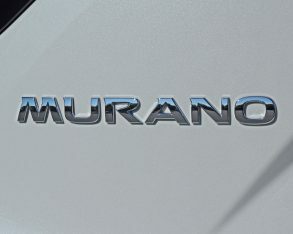 Just wait, there’s more. 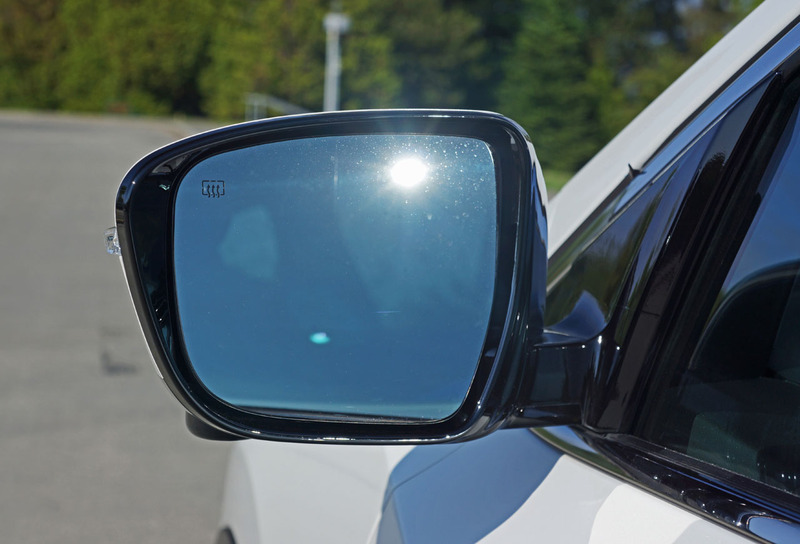 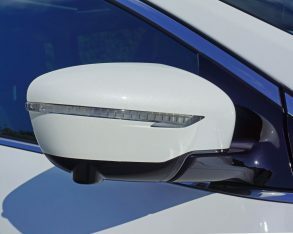 dual illuminated vanity mirrors, an overhead console with a sunglasses holder (which features a too-large hump in the middle that doesn’t fit an ordinary pair of sunglasses at all – epic fail with this one), an engine block heater, chrome door handles, powered heatable side mirrors with integrated LED turn signals, automatic on/off headlights, LED daytime running lights, LED taillights, 18-inch machine-finished alloy rims on 235/65R18 all-season rubber, hill start assist, four-wheel discs with ABS, electronic brake-force distribution, emergency brake assist, traction and stability control, tire pressure monitoring, a security alarm and immobilizer, plus all six regular airbags including a blocker for the driver’s knees. 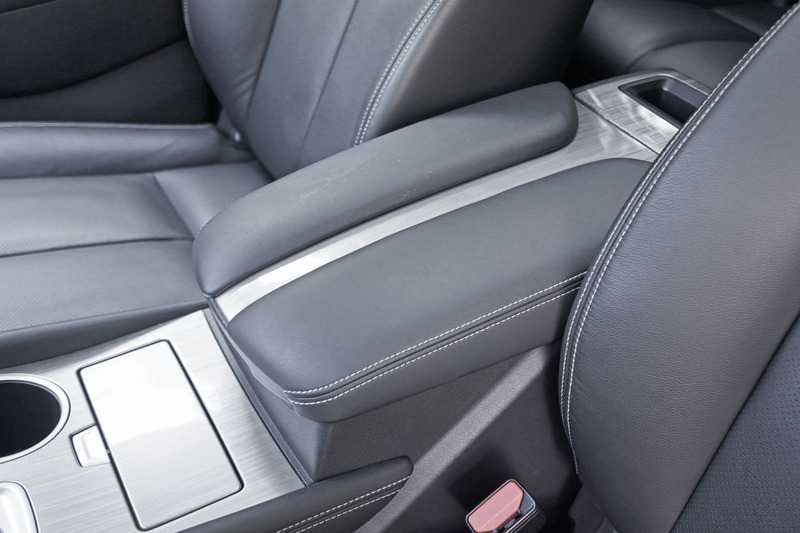 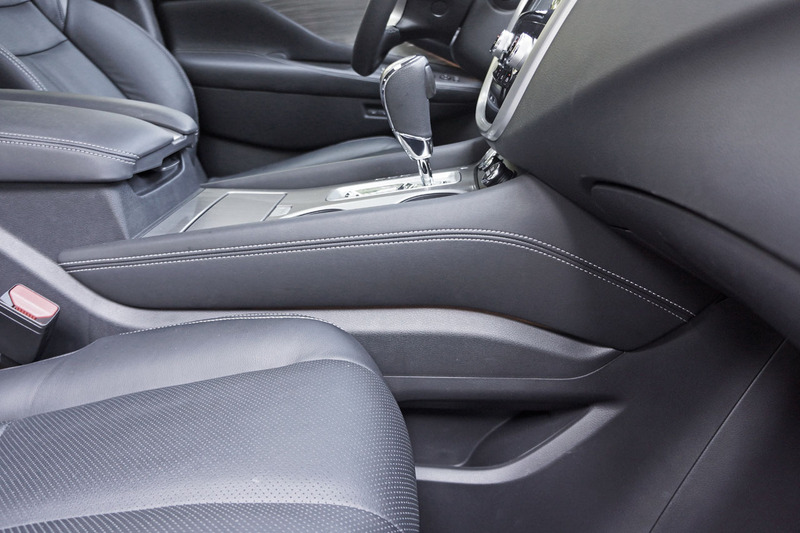 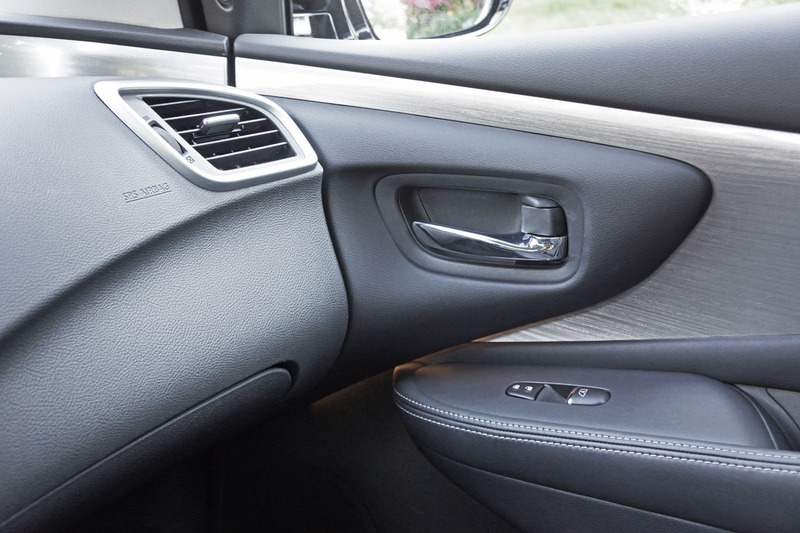 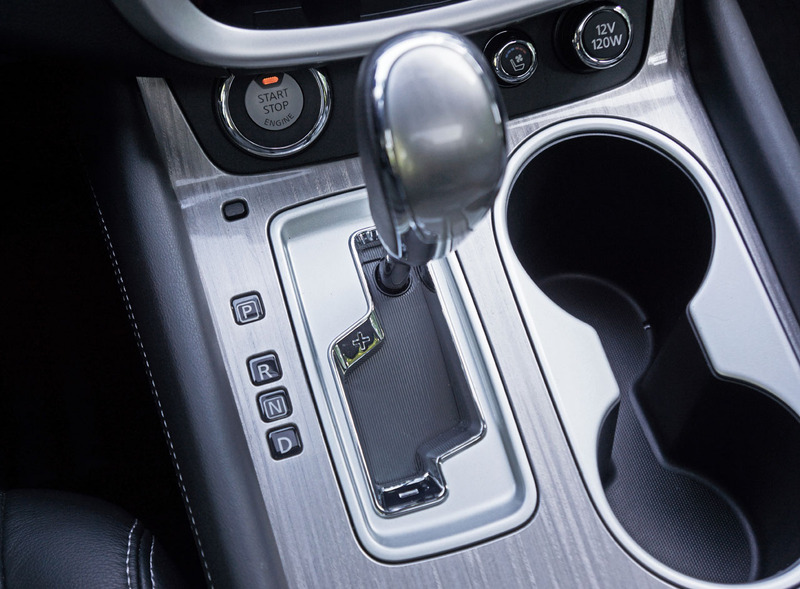 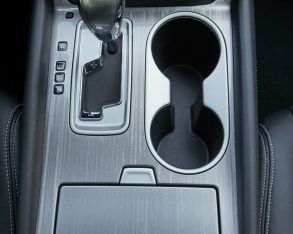 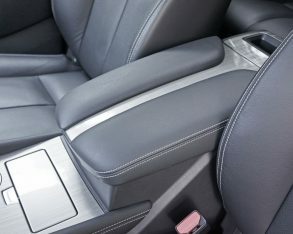 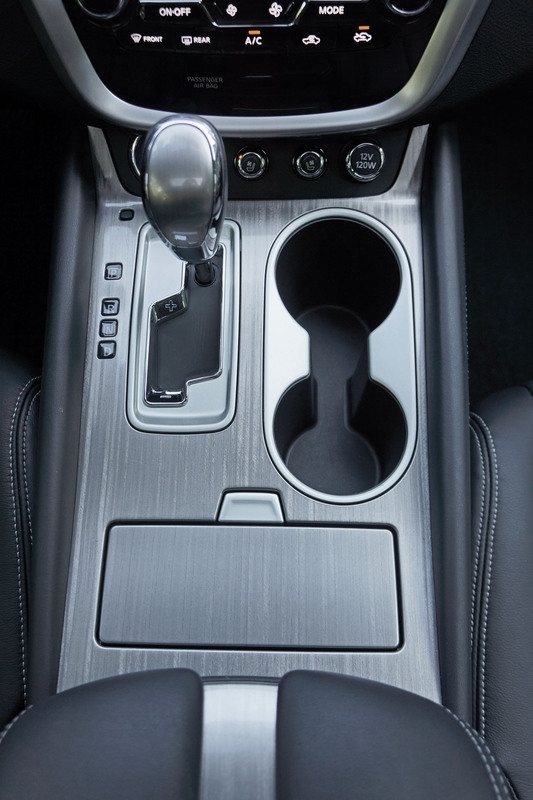 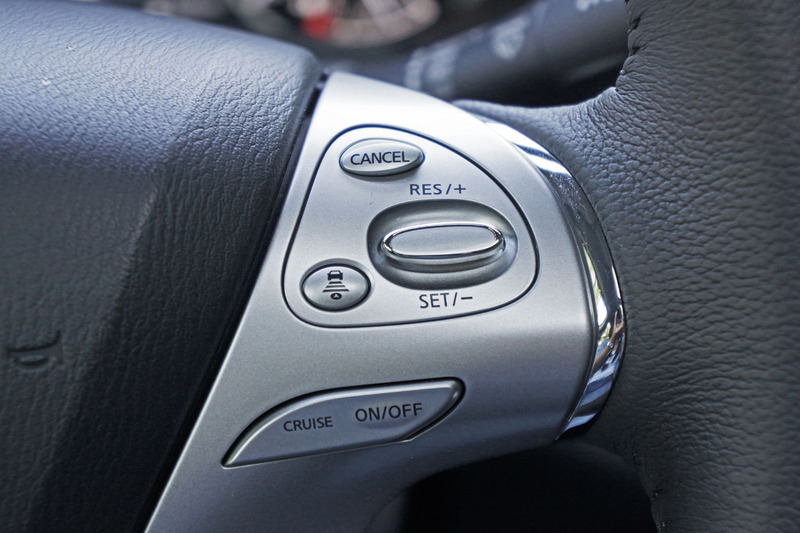 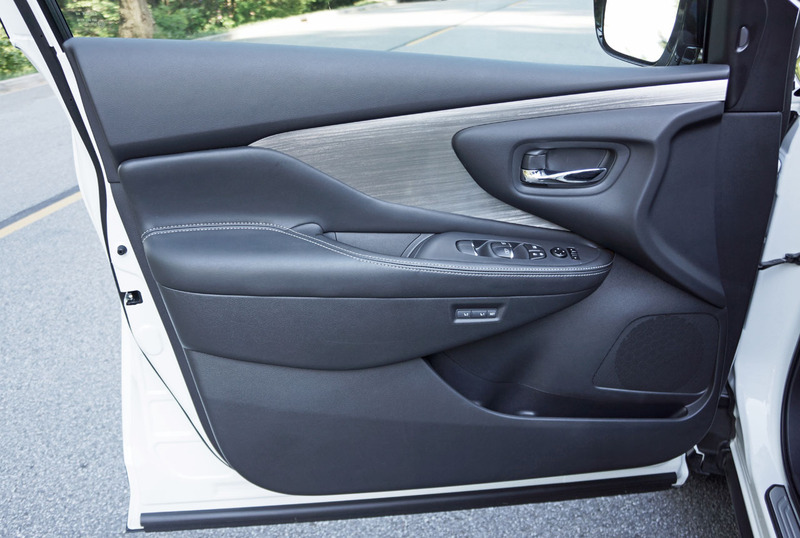 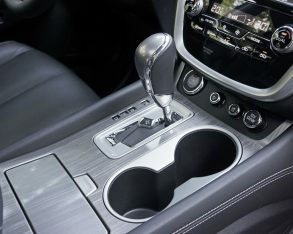 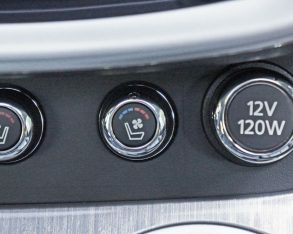 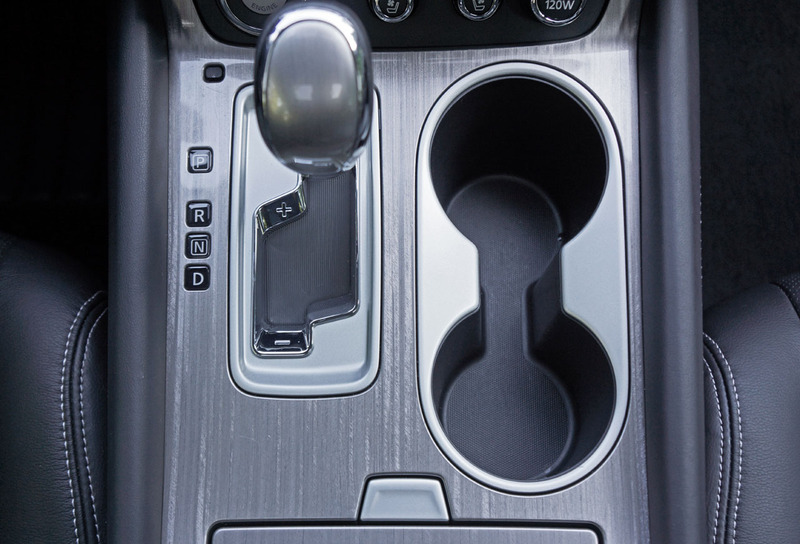 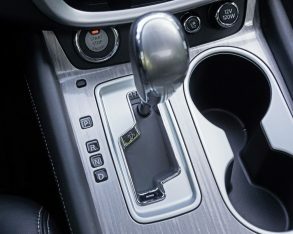 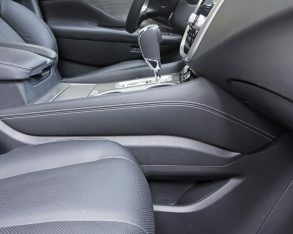 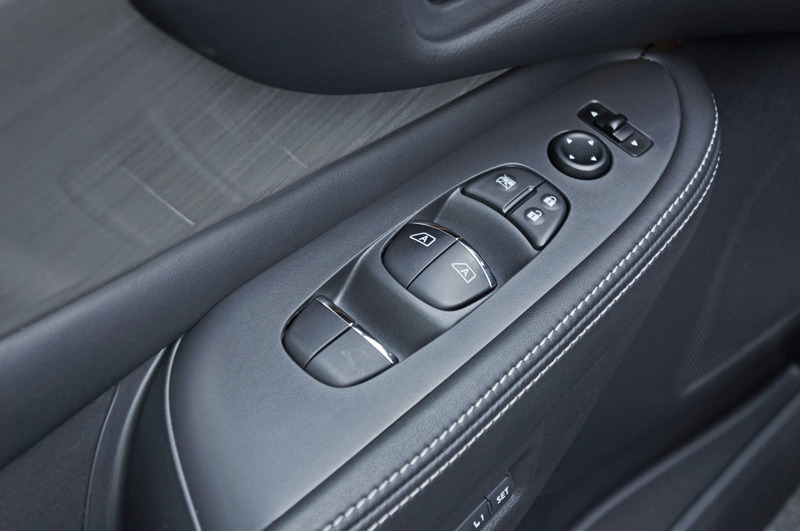 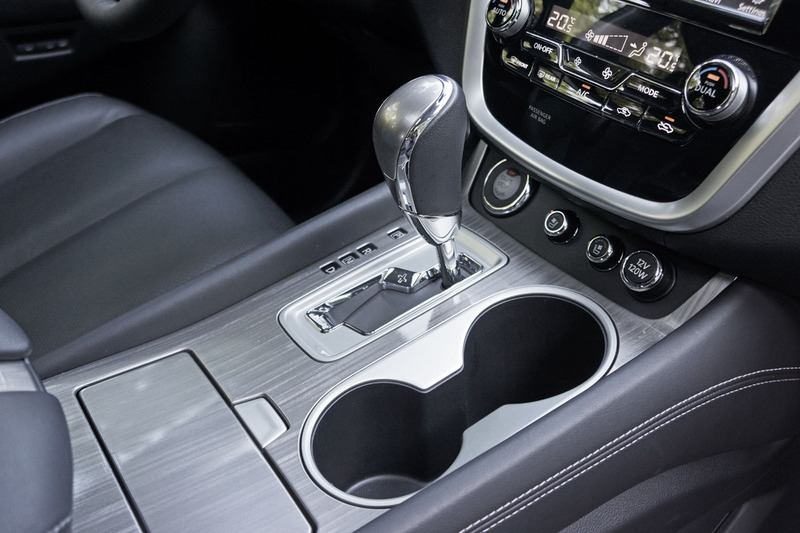 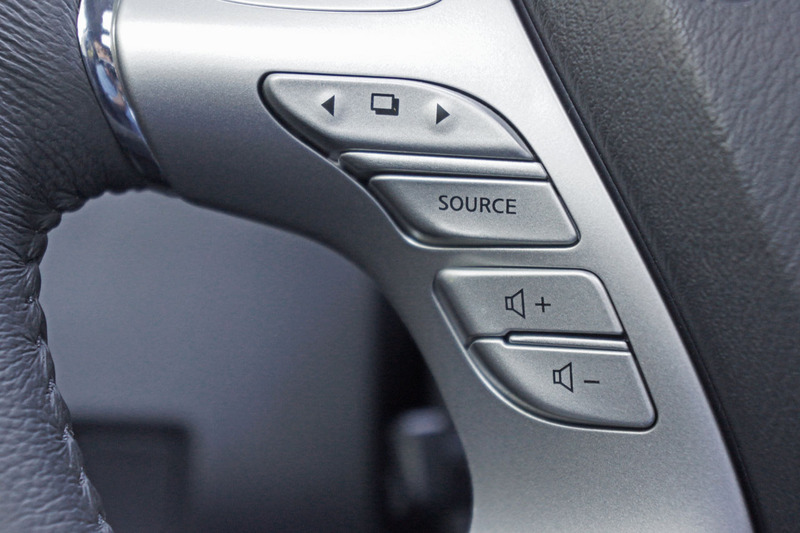 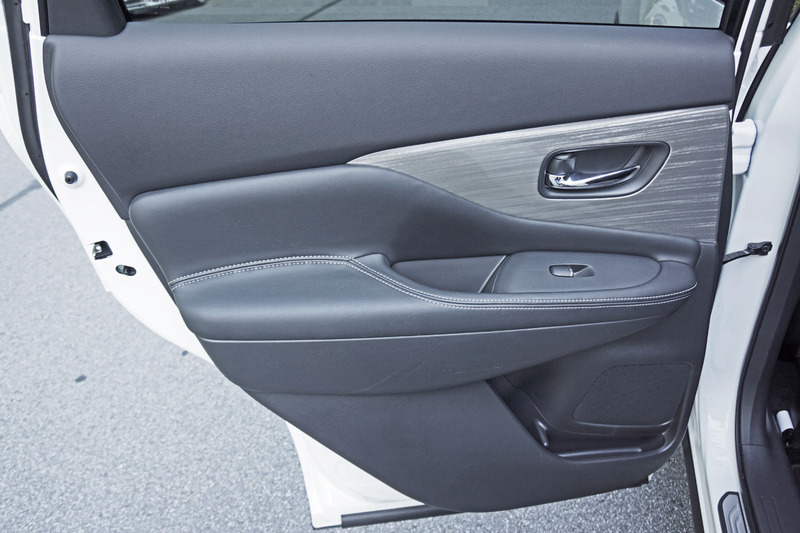 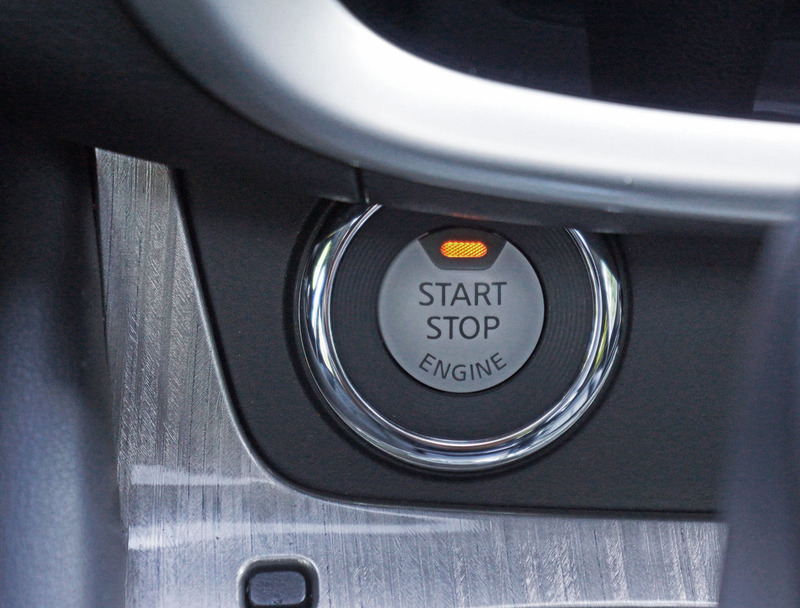 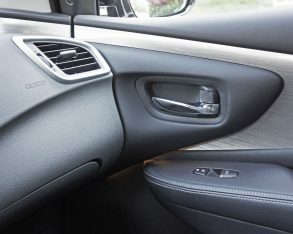 a leather-clad shift knob, remote start with Intelligent Climate Control, an eight-way powered driver’s seat with powered lumbar support replacing the six-way manual seat, a powered panoramic moonroof with one-touch open and close, and a powered liftgate. 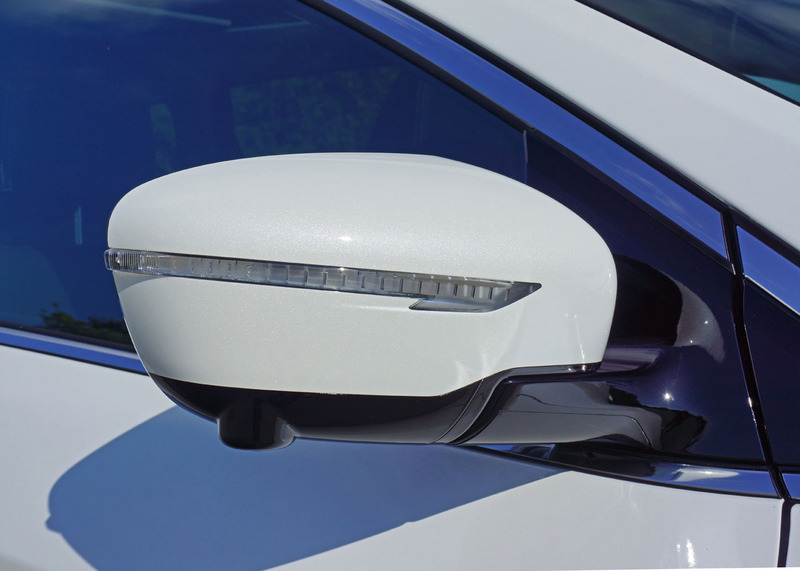 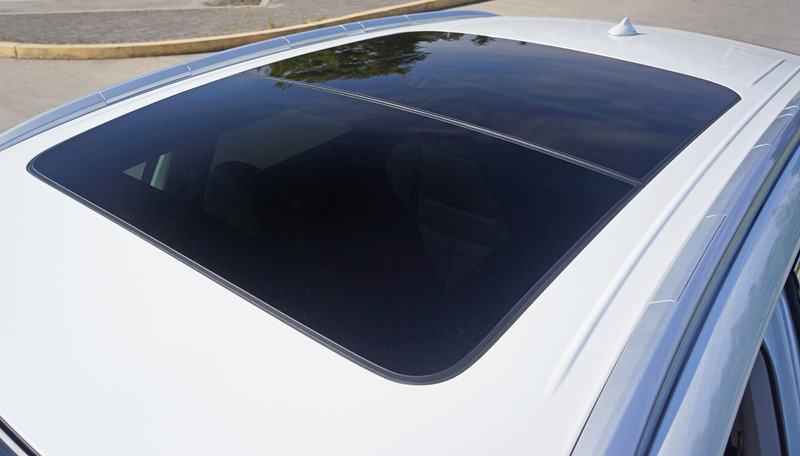 ambient lighting, a HomeLink universal garage door opener, silver roof rails instead of black, plus blind spot warning featuring rear cross traffic alert with moving object detection. 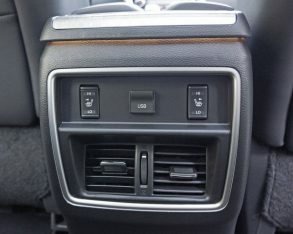 Incidentally, the powered rear seatback release button I mentioned earlier is located next to the driver’s left knee and lowers the 60-percent portion of the back seats, a really handy feature if you’re picking up the kids from the ski hill on a cold winter’s day and don’t feel like getting out and trudging through the muck to drop it manually. 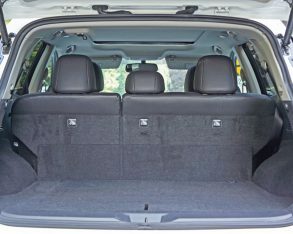 (45.0 inches) across, while you should be able to fit something 808 mm (31.8 inches) tall inside as long as you can get it though the hatch. 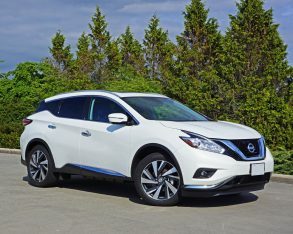 You might be surprised at the way Nissan has finished it too. 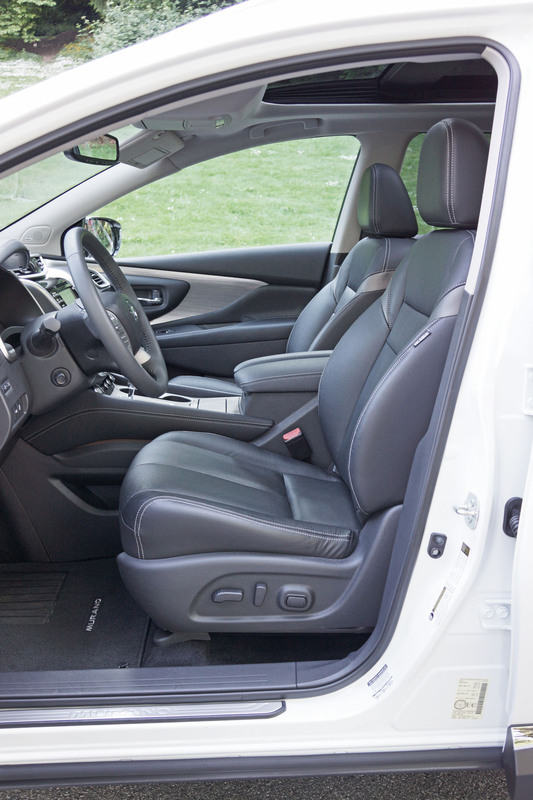 Like the rest of the cabin, it gets extremely nice carpeting covering almost every millimeter. 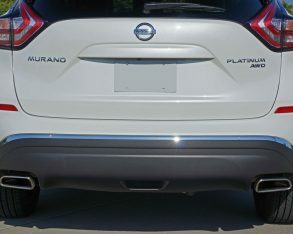 nice long, lean look. 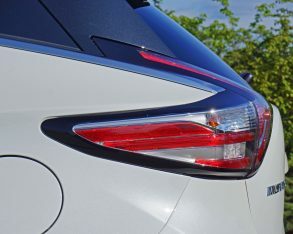 Interestingly though, its wheelbase has remained more or less the same throughout its three generations, first measuring 2,825 mm (111.2 in) in 2003 before being slightly reduced to 2,824 mm (111.0 inches) in 2009, where it sits now. 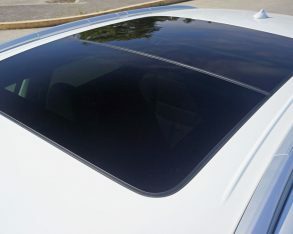 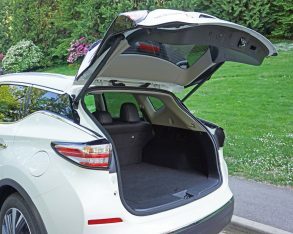 its raked rear roofline and narrow rear quarter windows. 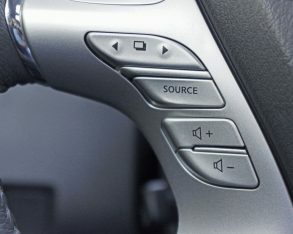 Braking is good for the class too, with less fade after repeated aggressive application than most competitors, plus excellent emergency response and control. 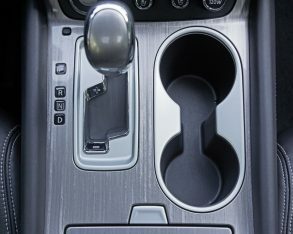 trucks in a pinch. 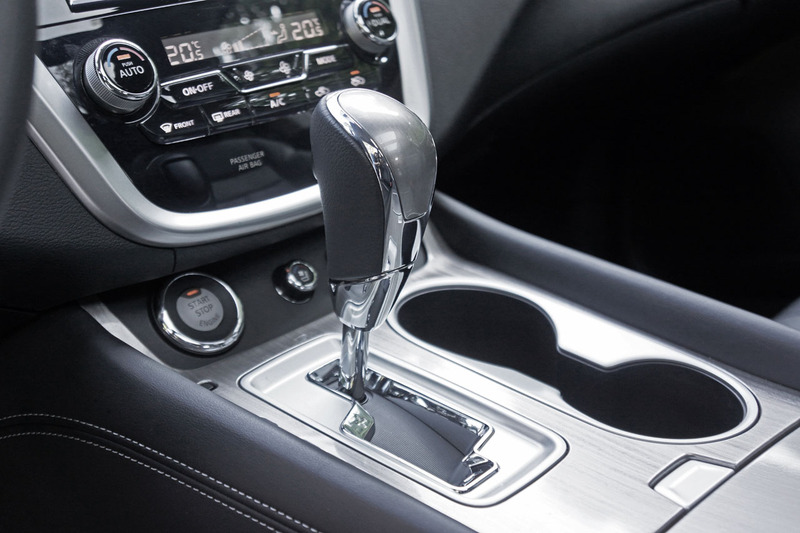 Even its fuel economy is quite good when compared to mid-size challengers, no doubt due to its advanced continuously variable transmission. 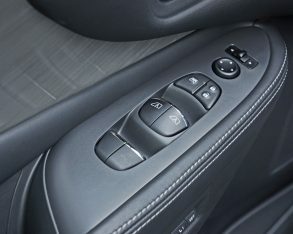 that delivers snappy faux shift increments that are very similar to what you can experience with a regular automatic. 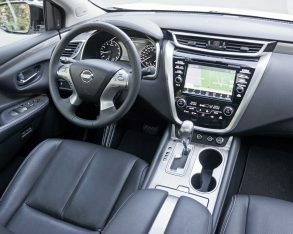 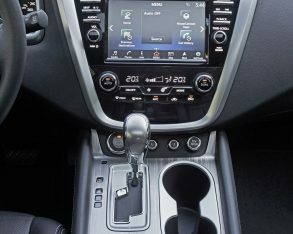 I wish Nissan had gone the extra mile and included steering wheel-mounted paddles with this top-line Murano at least, but DIY shifting is possible via the gear lever. 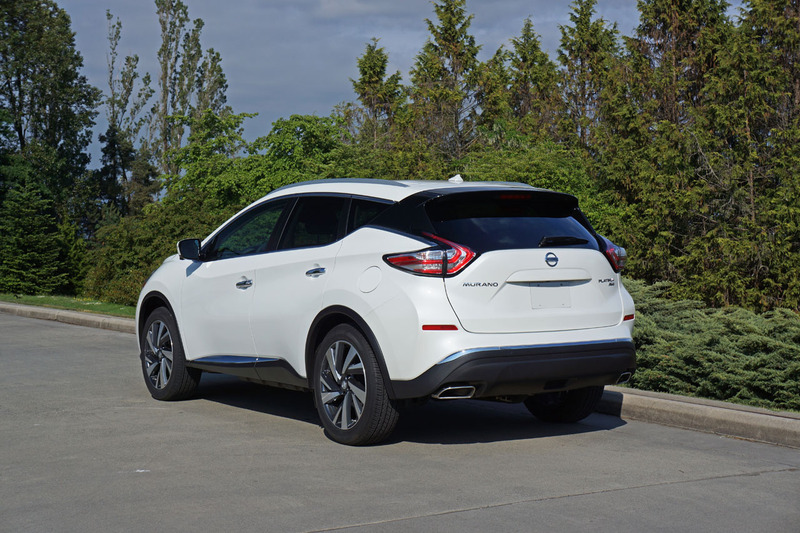 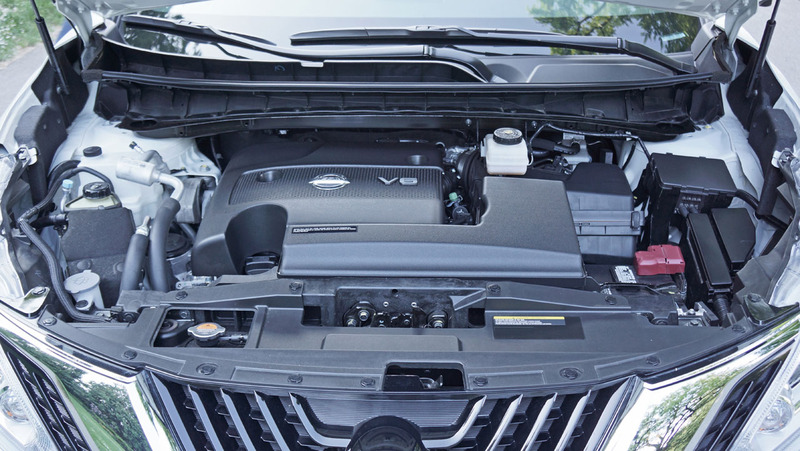 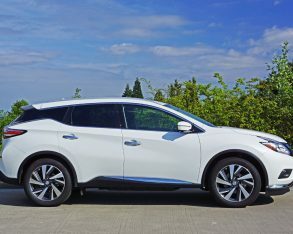 If the CVT is left to its own devices and your right foot is more relaxed than engaged the Murano can achieve a claimed five-cycle EnerGuide fuel economy rating of 11.0 L/100km in the city and 8.2 on the highway with FWD, or 11.2 city and 8.3 highway with as-tested AWD, which is not bad at all. 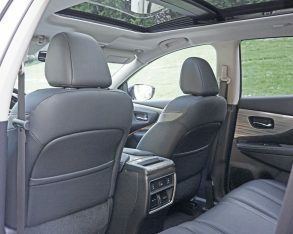 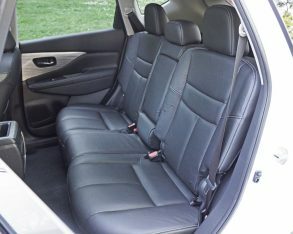 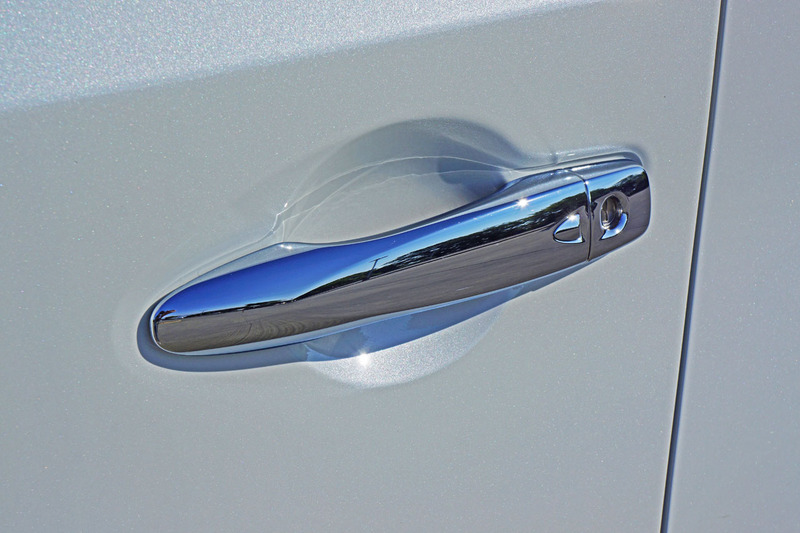 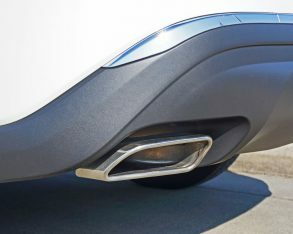 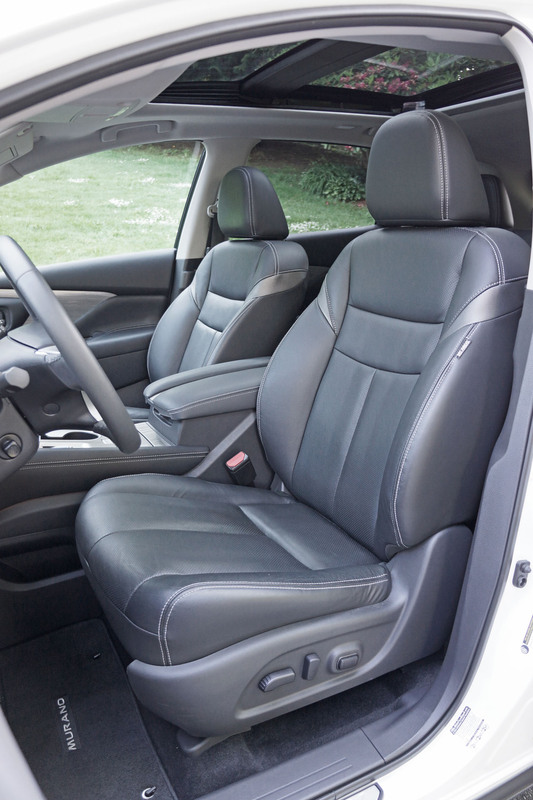 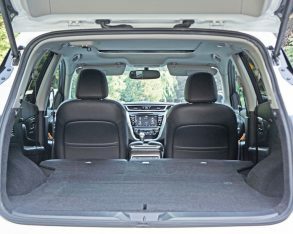 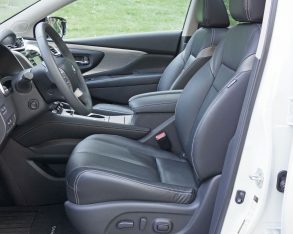 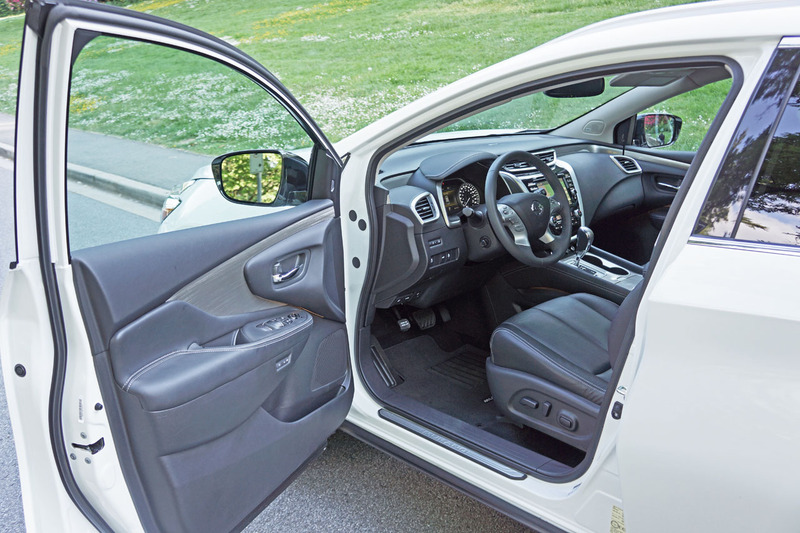 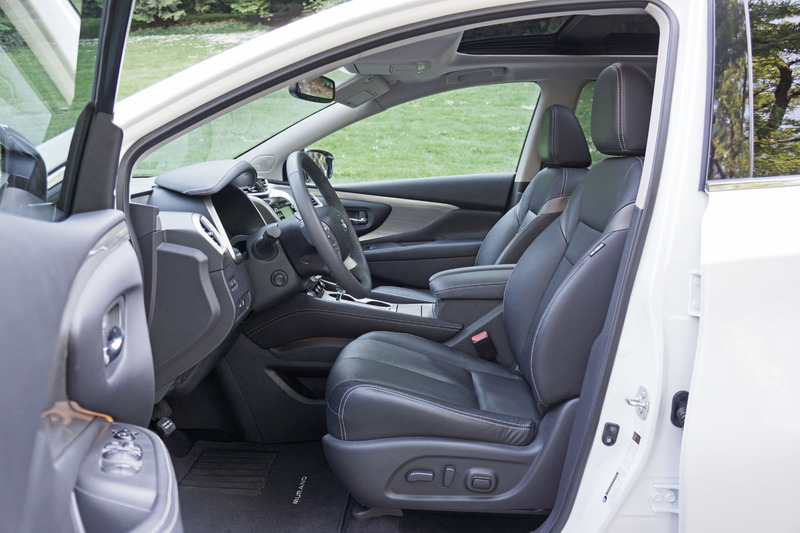 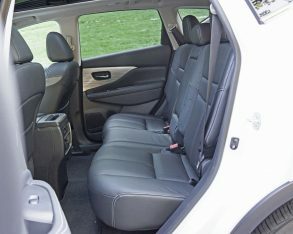 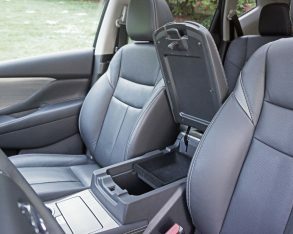 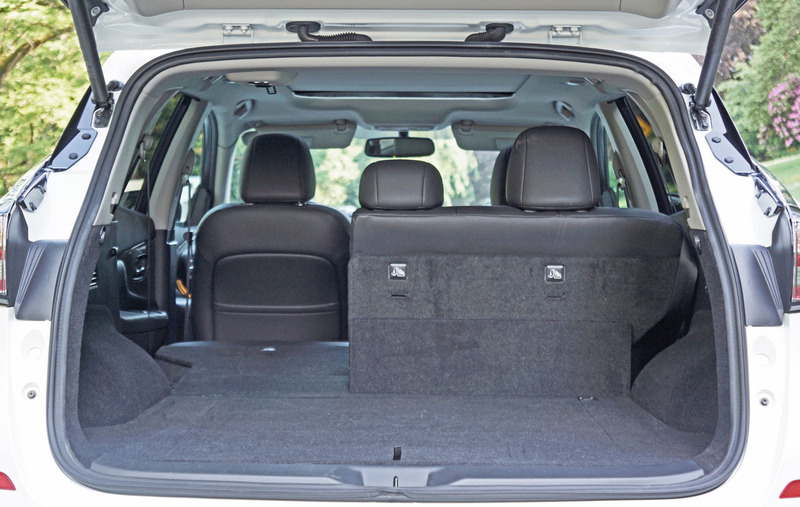 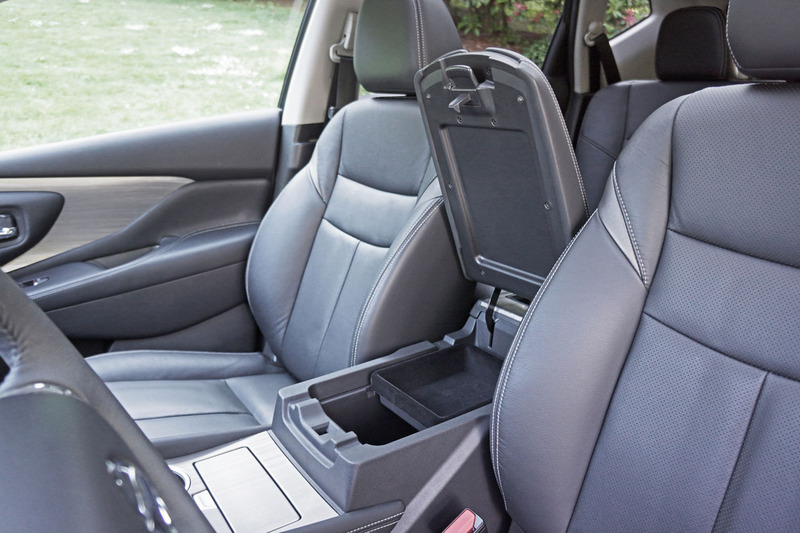 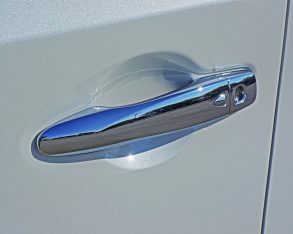 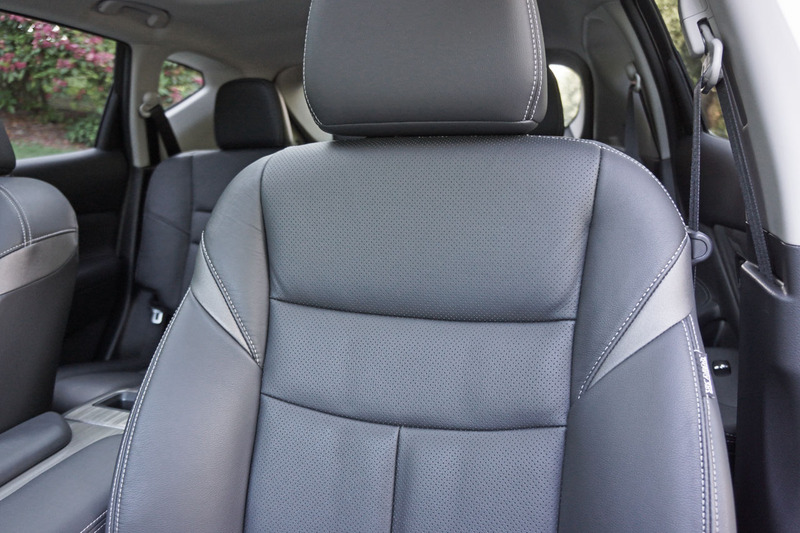 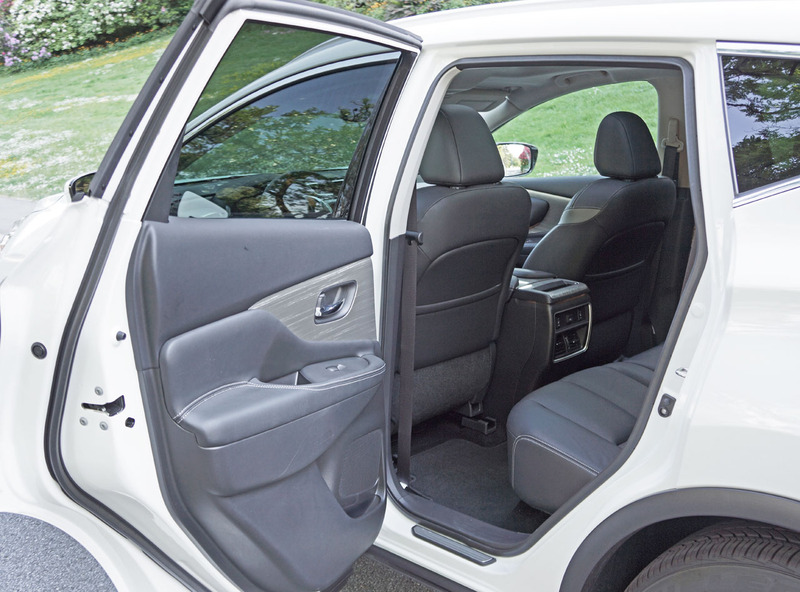 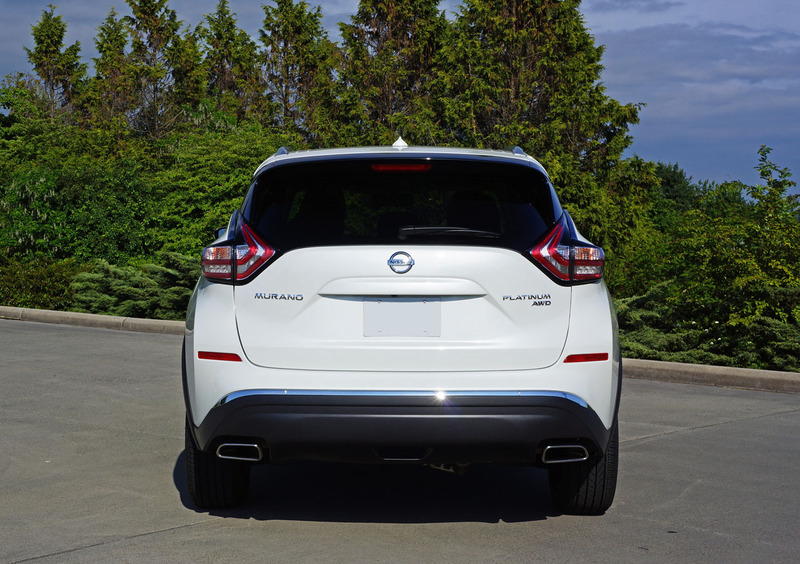 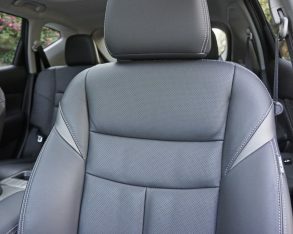 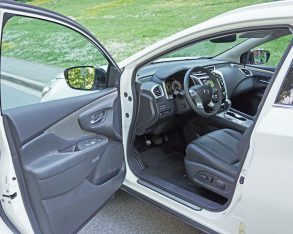 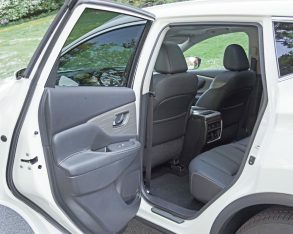 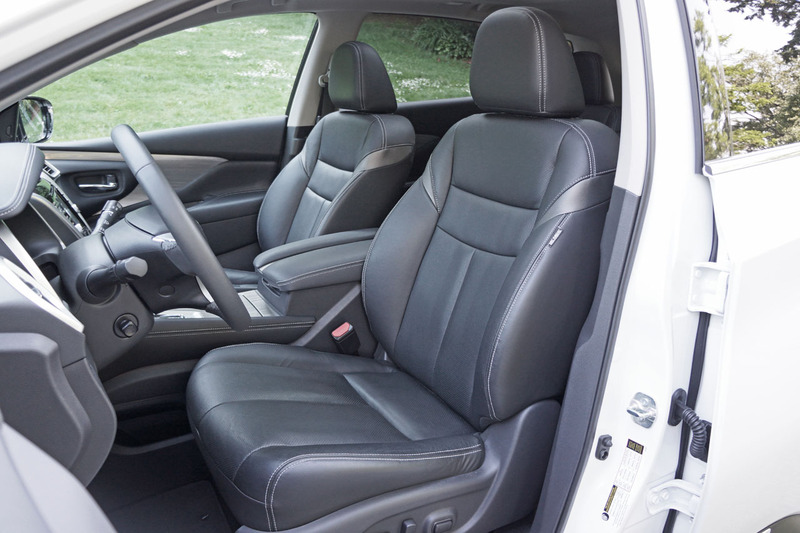 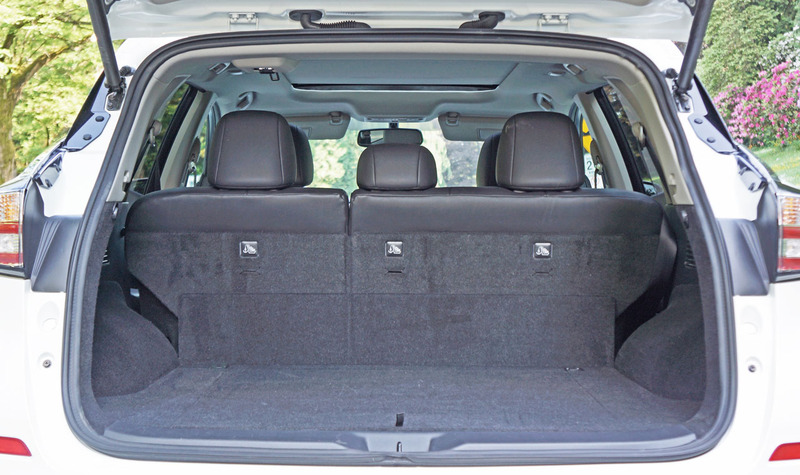 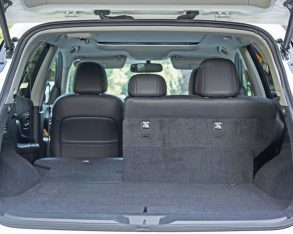 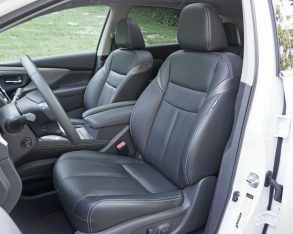 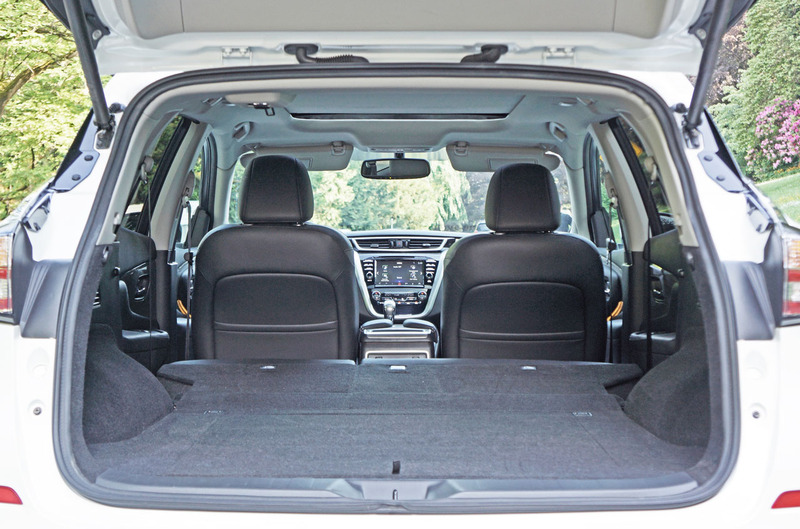 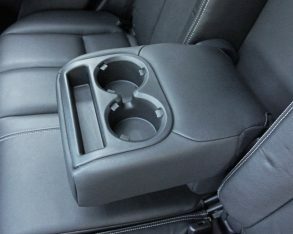 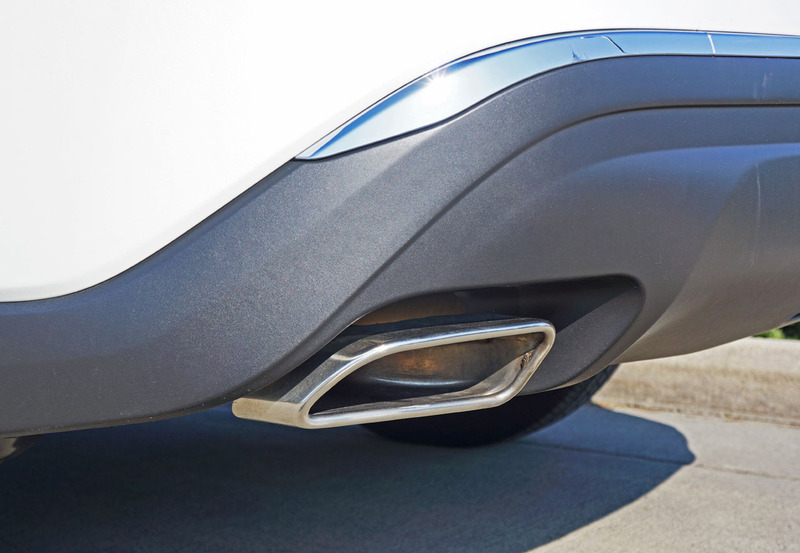 with its optional front crash prevention systems, although the NHTSA only gave it 4 stars out of 5 due to divided results in frontal crash safety, the driver getting 5 stars and the front passenger only 3; so maybe you shouldn’t yell shotgun too quickly if catching a ride in this SUV. 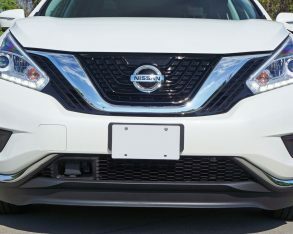 It gets 5 stars in side-impact tests, however, but again only 4 in rollover tests, where it was given a 15.9-percent chance to roll if using sharp, aggressive maneuvers to avoid an accident. 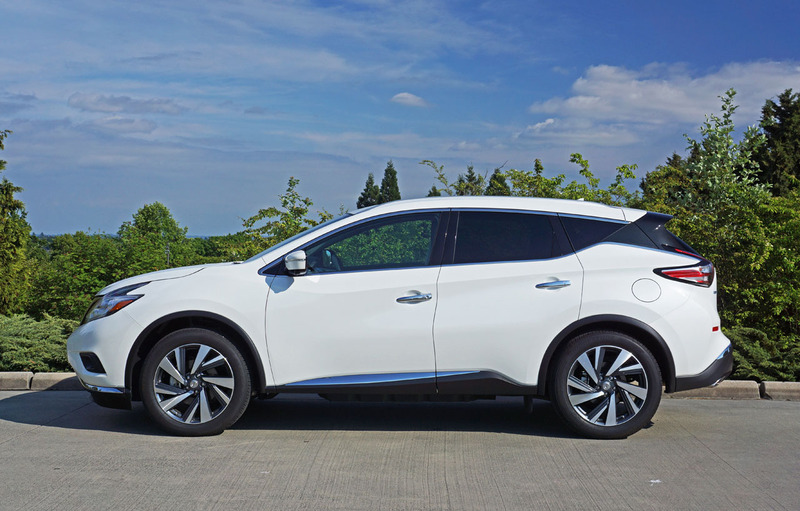 To be fair most of the Murano’s competitors suffer from the same rollover fate, but in the same breath the majority achieve 5 star frontal ratings so therefore get 5 star scores overall. 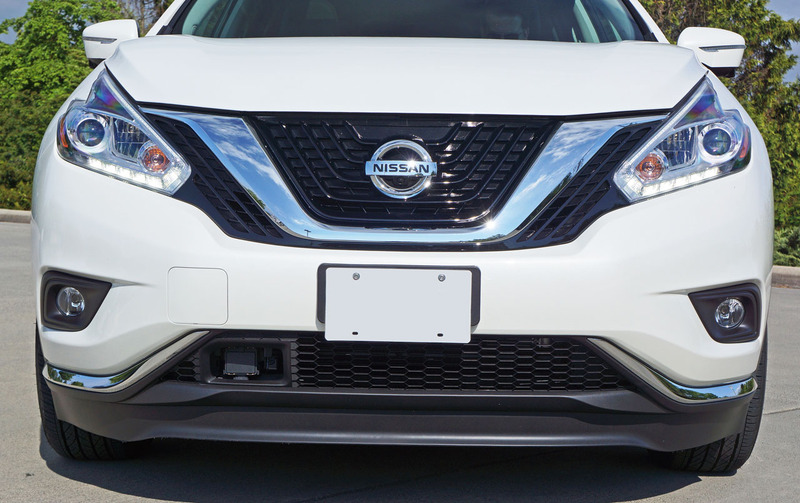 Nissan will want to remedy this situation quickly, but as it is the same so-so safety score also shows up in more recent 2016 NHTSA tests. 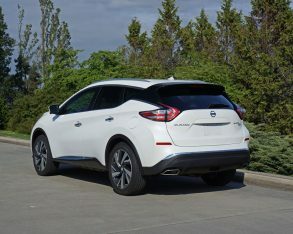 I hate to leave such an impressive CUV in such a negative light, but the facts are the facts and now that you have them at your disposal you can choose your mid-size SUV based on priorities. 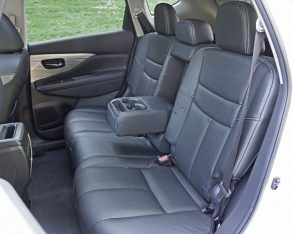 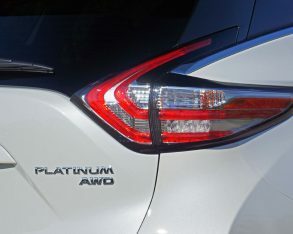 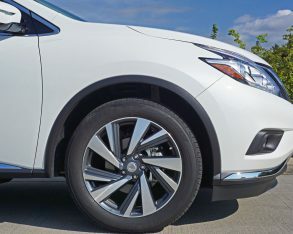 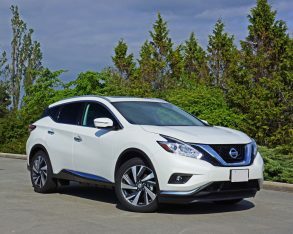 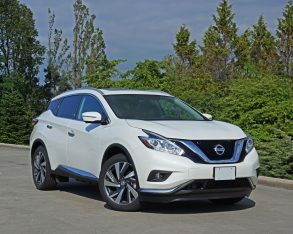 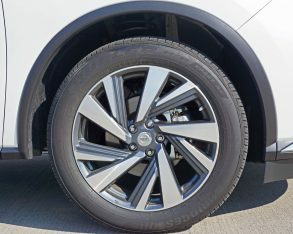 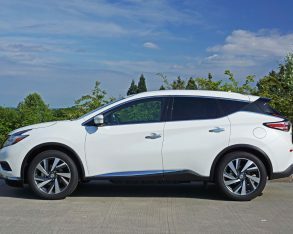 If alluring styling from the outside in, athletic performance, good fuel economy, an impressive standard and optional set of features, decent expected reliability, and excellent value matter most, I highly recommend the new Murano, as I certainly enjoyed time spent with this fashionably functional crossover SUV.